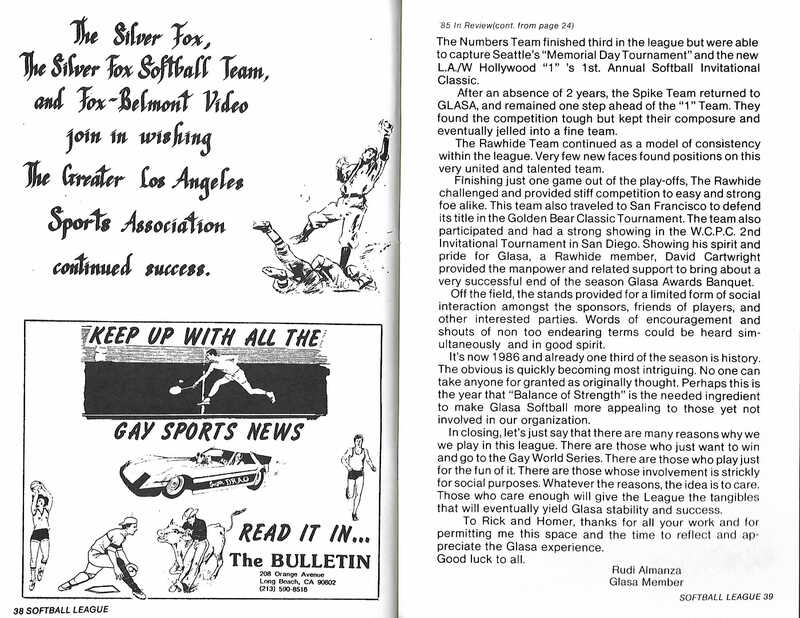 Gay softball has its roots back in the late sixties and seventies. 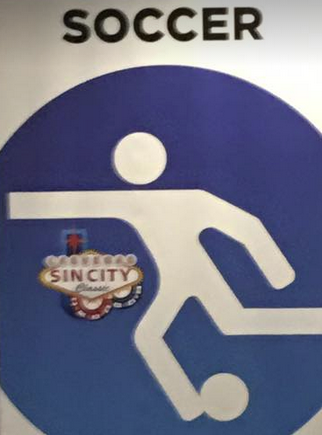 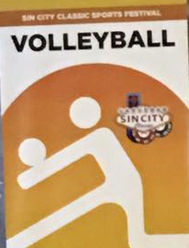 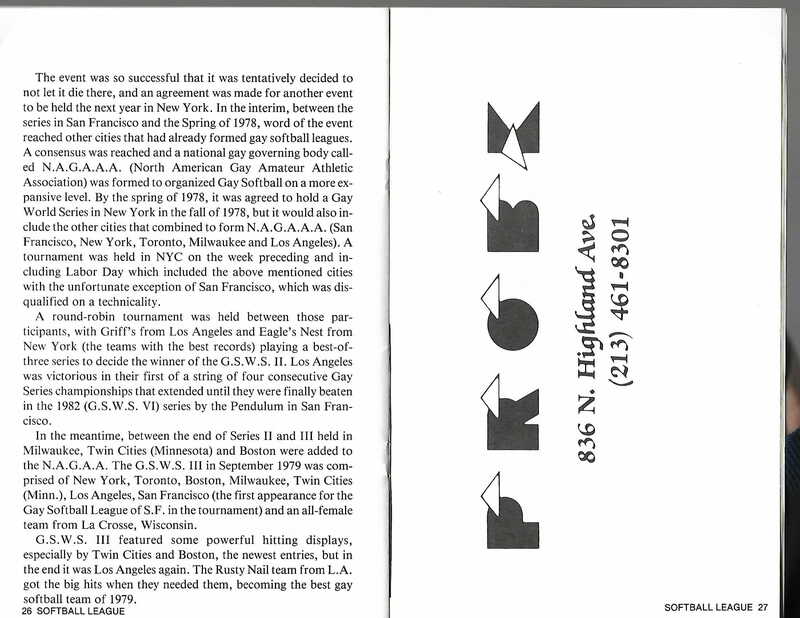 Then, gay teams starting forming in various cities around the country and either joined municipal leagues or just played pick-up games among themselves. 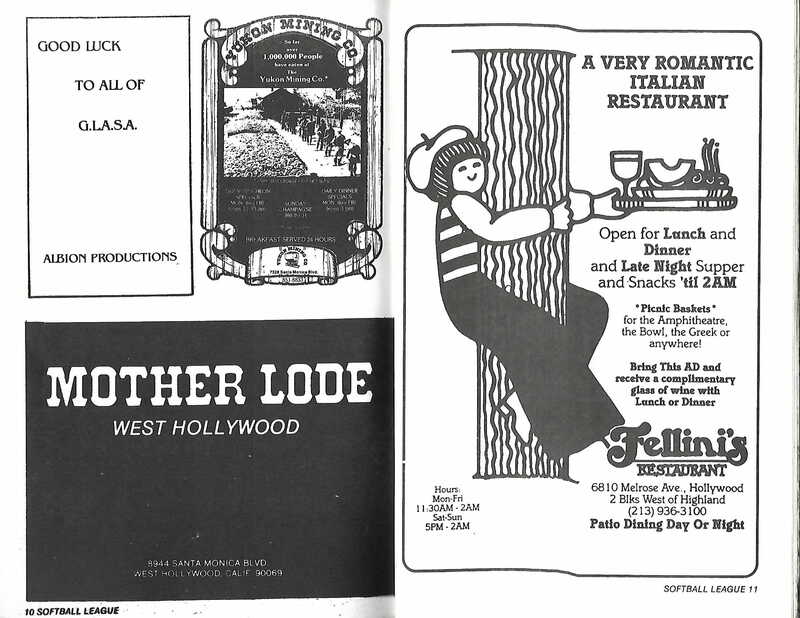 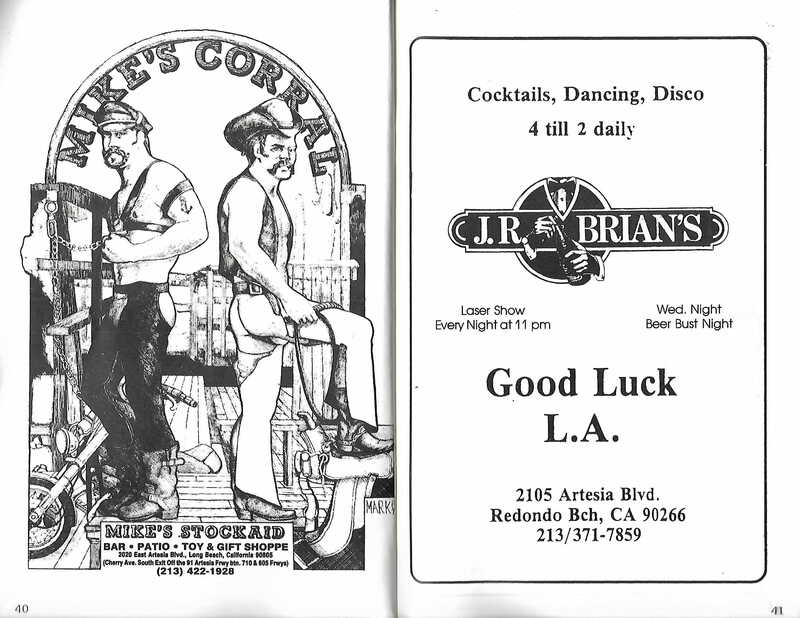 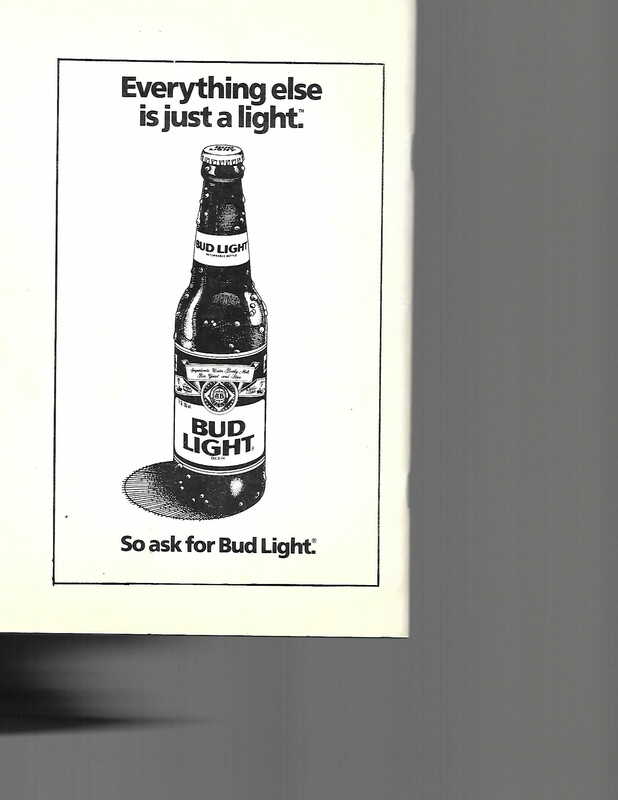 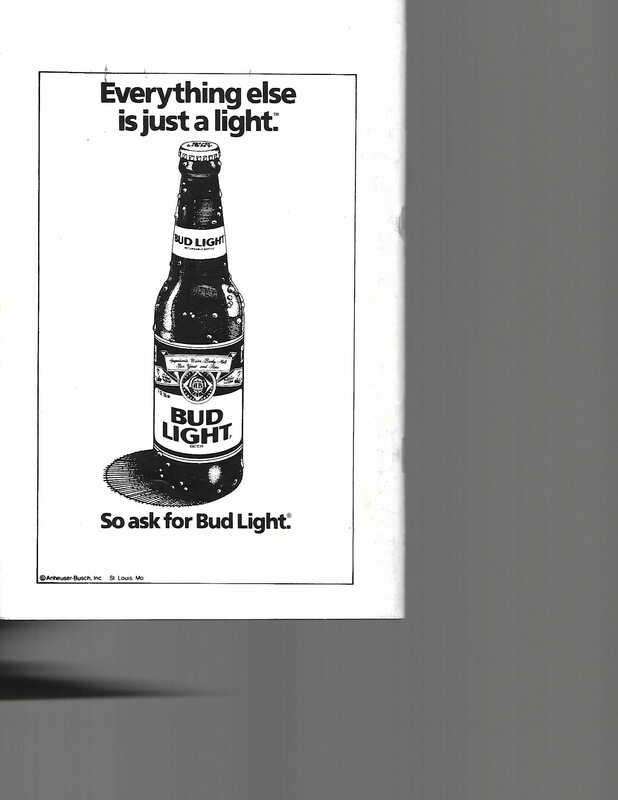 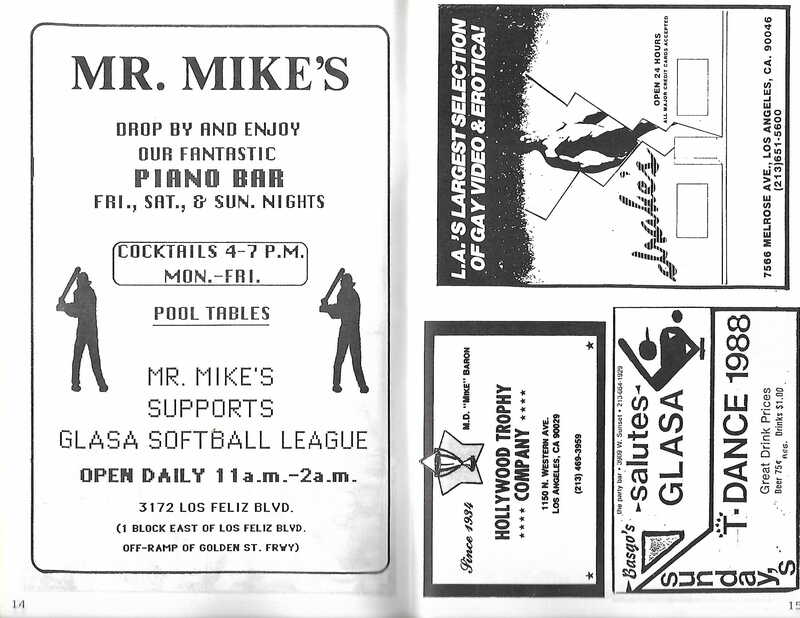 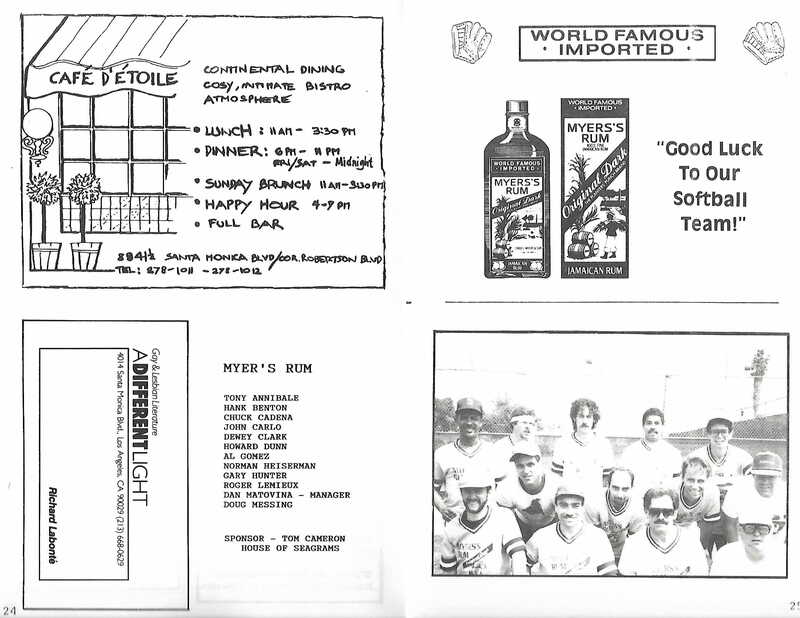 In 1977, in an effort to promote his new bar, a San Francisco business owner invited New York City to send a team to San Francisco. 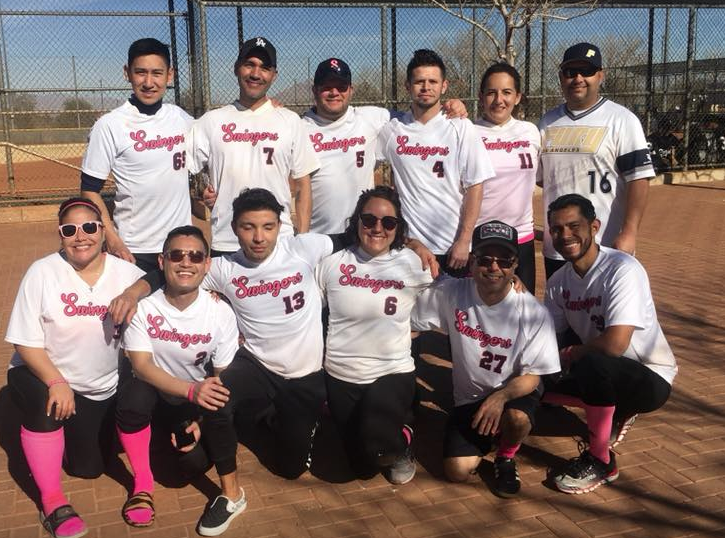 Thus, the Badlands team, representing the Community Softball League of San Francisco played a composite team (Badlands, Eagles, Nest and Nickel bars) representing the Big Apple League in New York City. 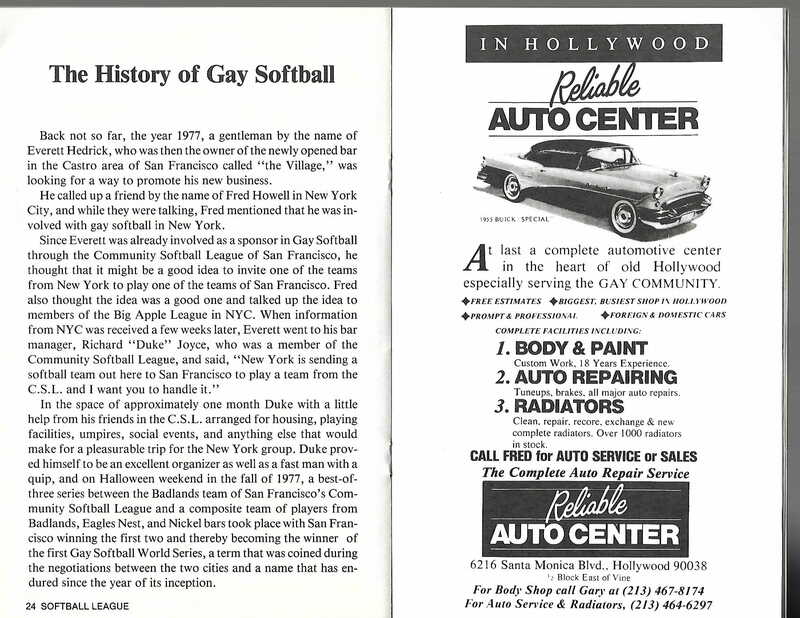 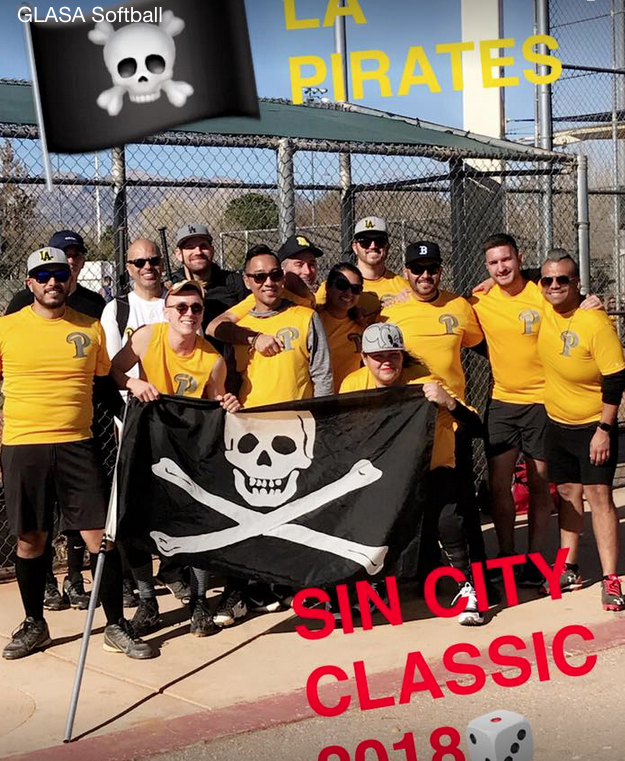 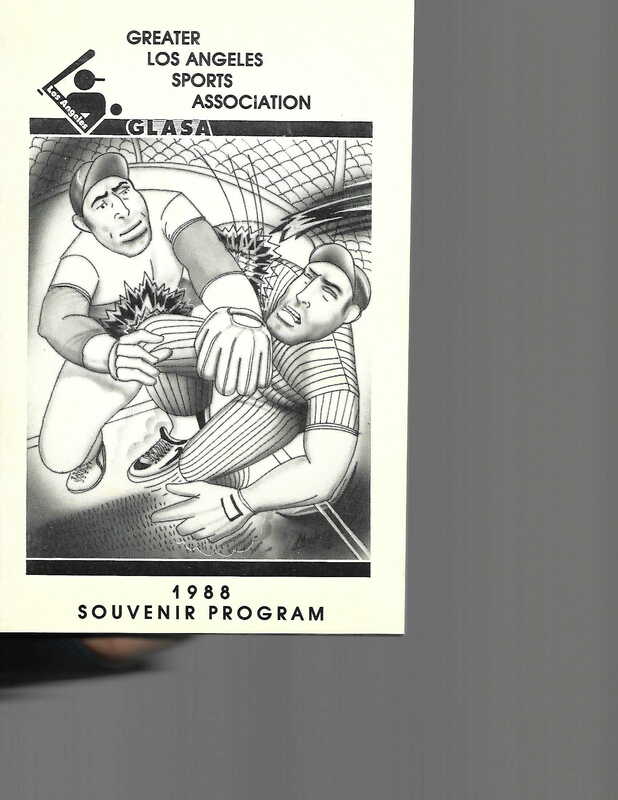 San Francisco won the best of three series, thereby becoming the winner of the first "Gay Softball World Series," a term coined during the negotiations between the two cities and which has endured to this day. 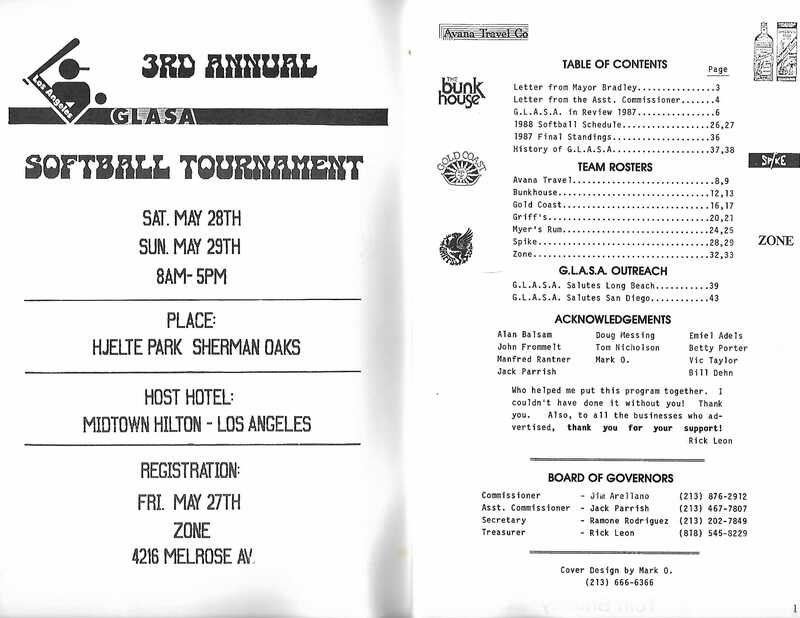 The event was so successful that it was decided to hold it the following year in New York City. 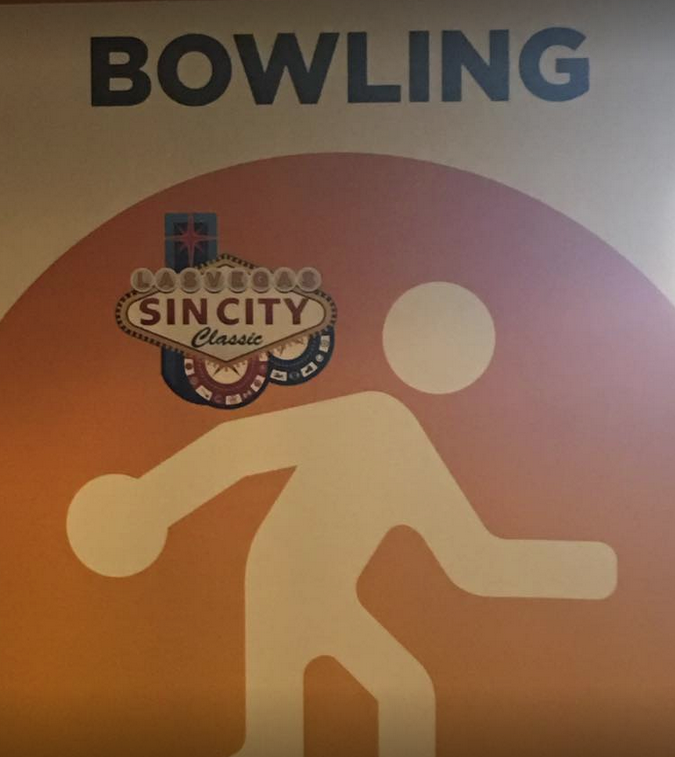 By then, word had reached other cities. 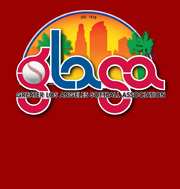 A consensus was reached to form a national governing body, including charter members San Francisco, New York City, Toronto, Los Angeles and Milwaukee. 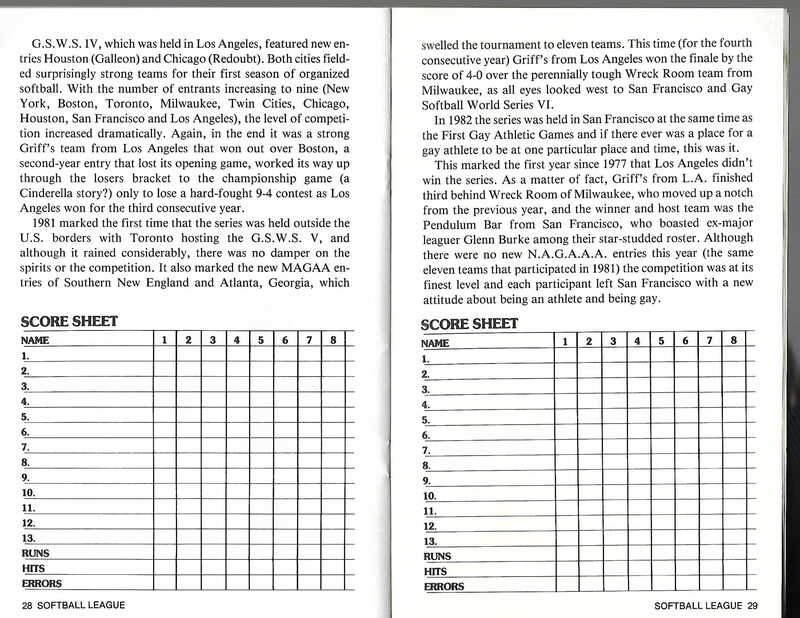 The second series in New York City included all member cities except San Francisco, which was disqualified due to a technicality. 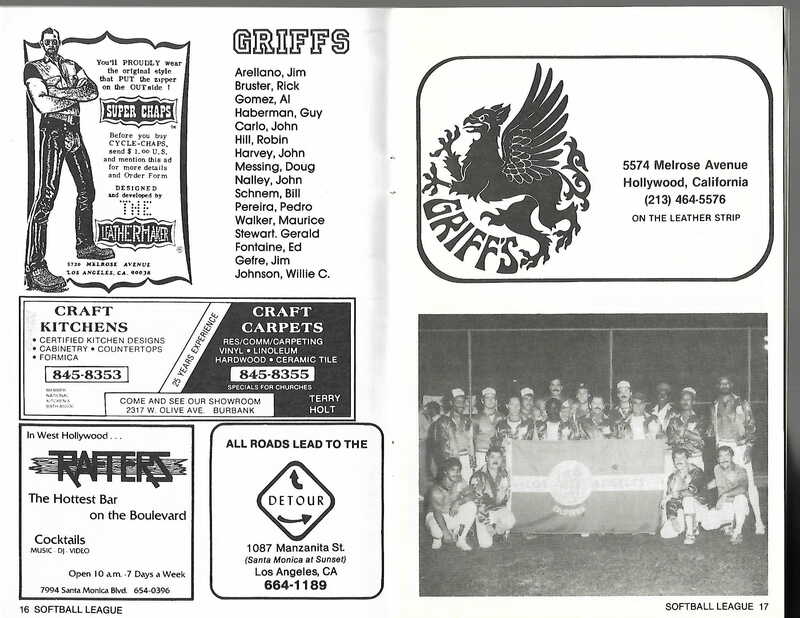 In that series, Griffs from Los Angeles beat the Eagles' Nest from New York City, beginning a string of four consecutive championships for LA teams. 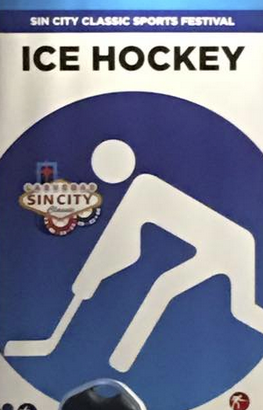 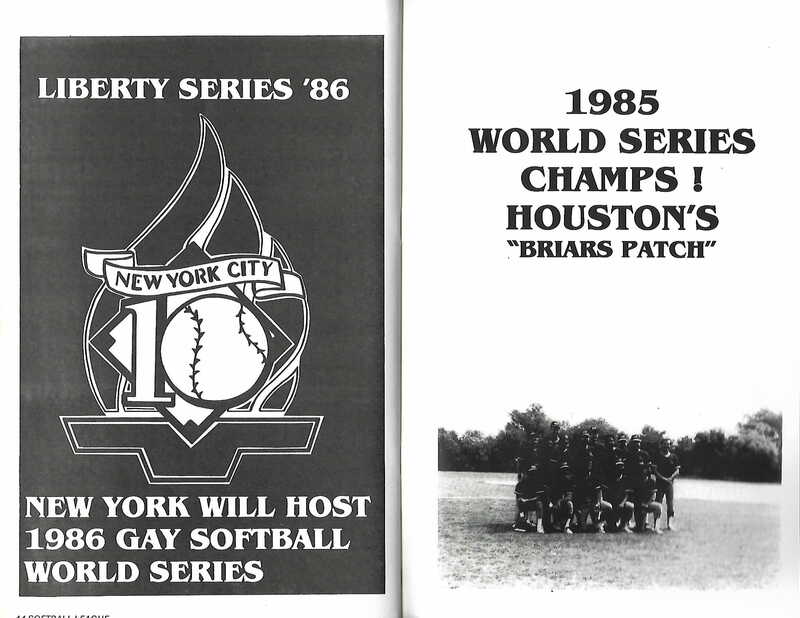 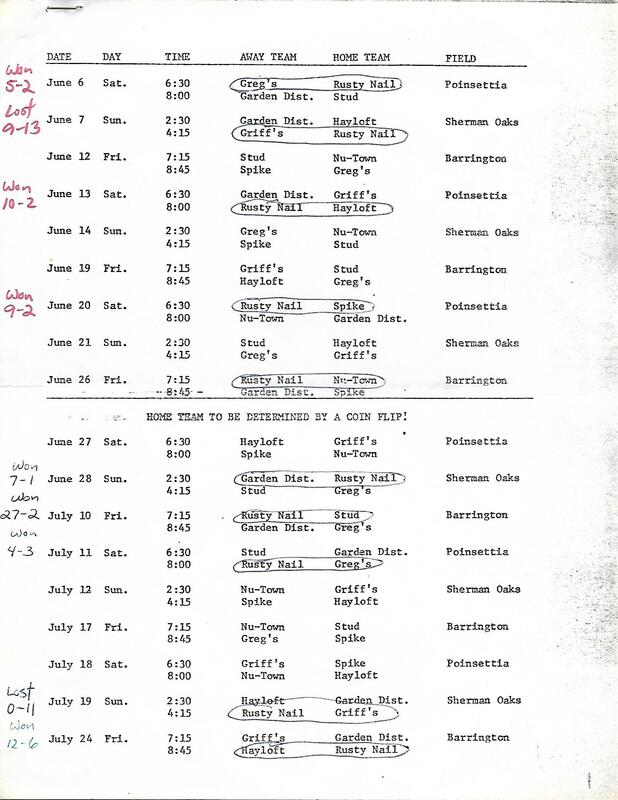 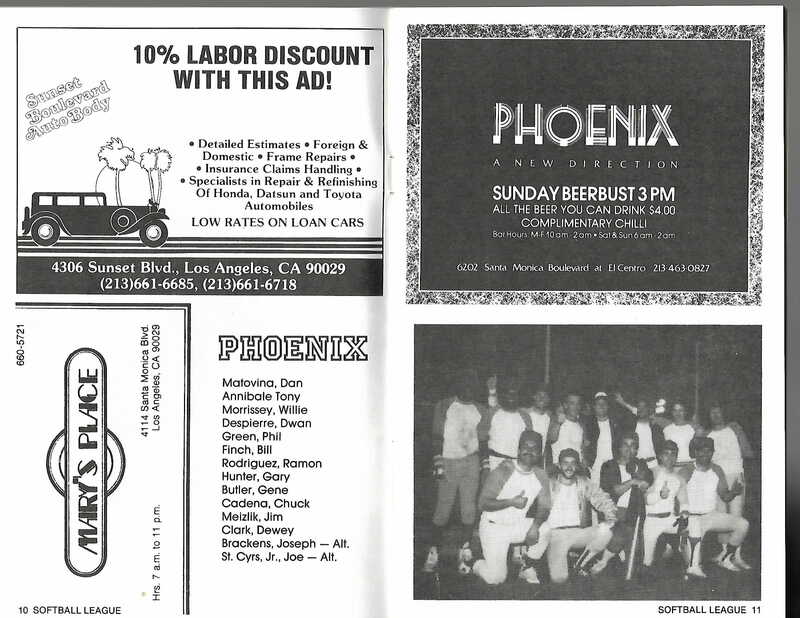 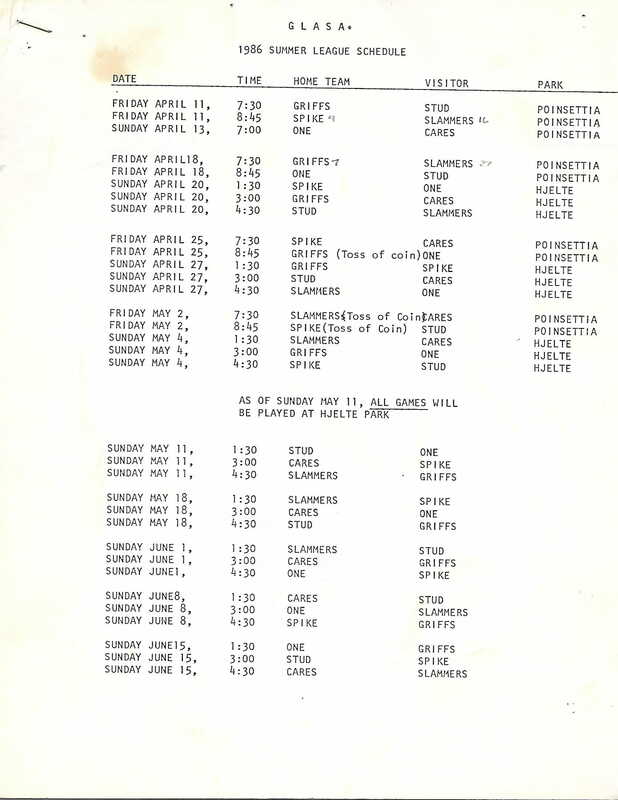 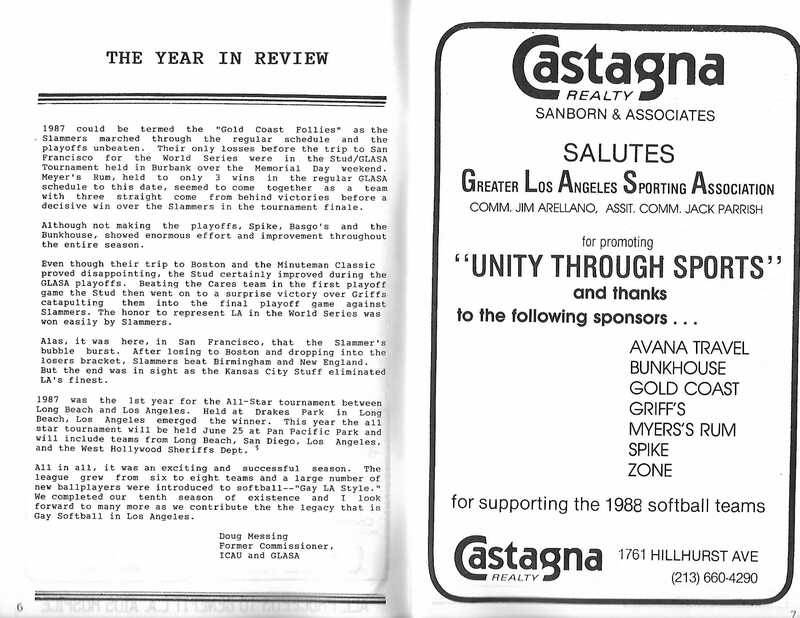 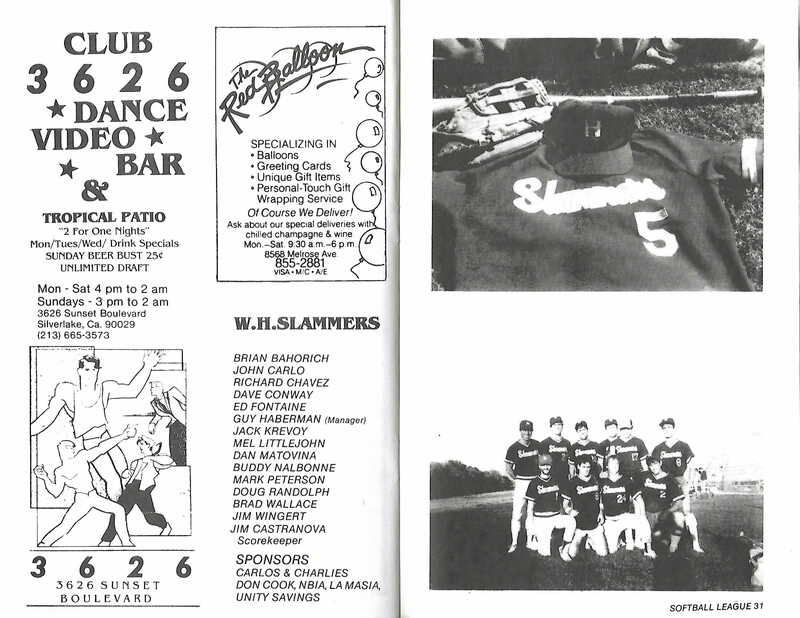 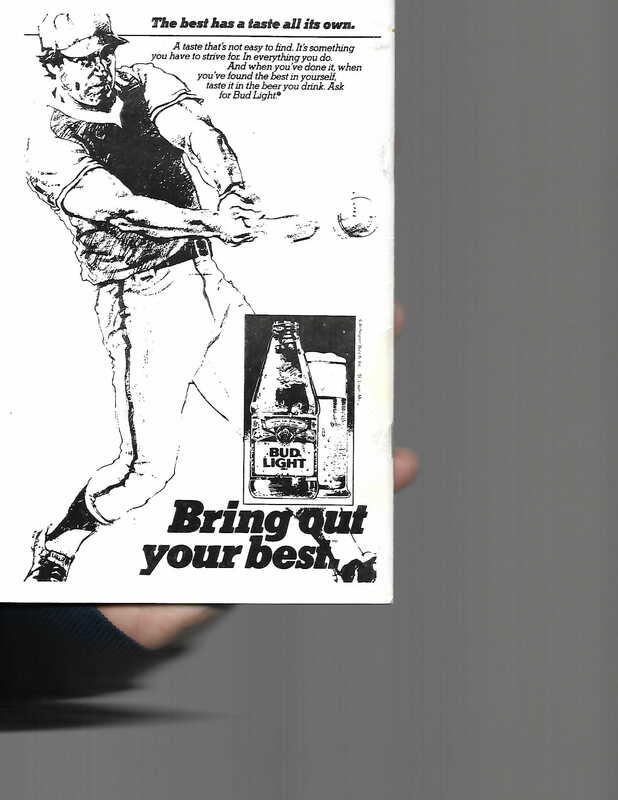 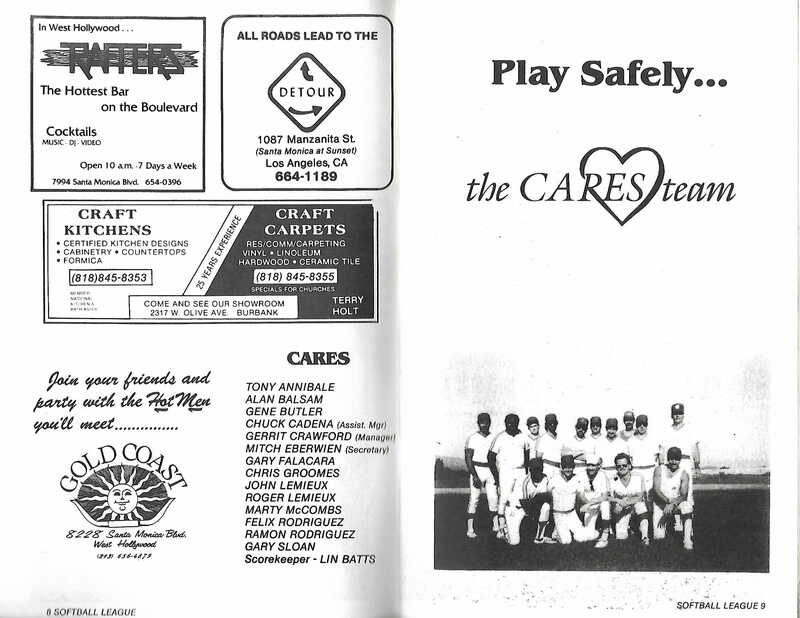 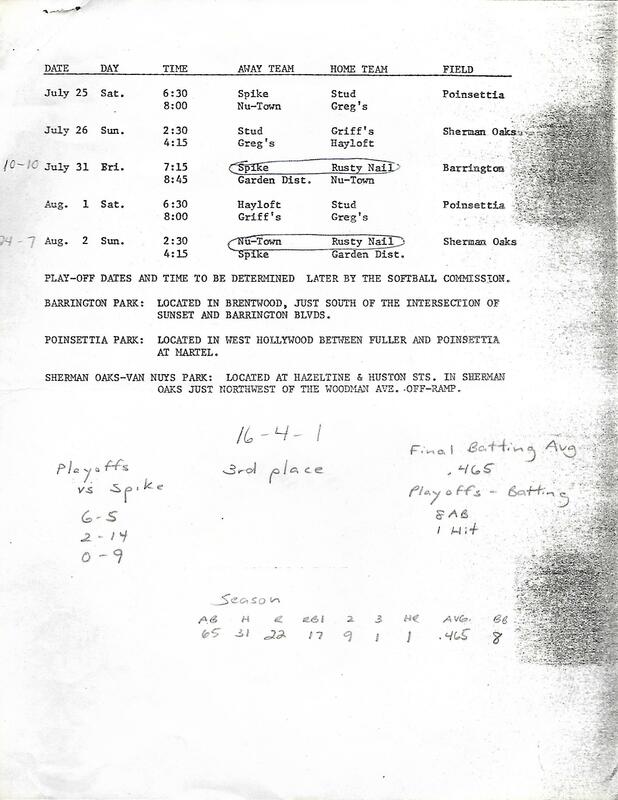 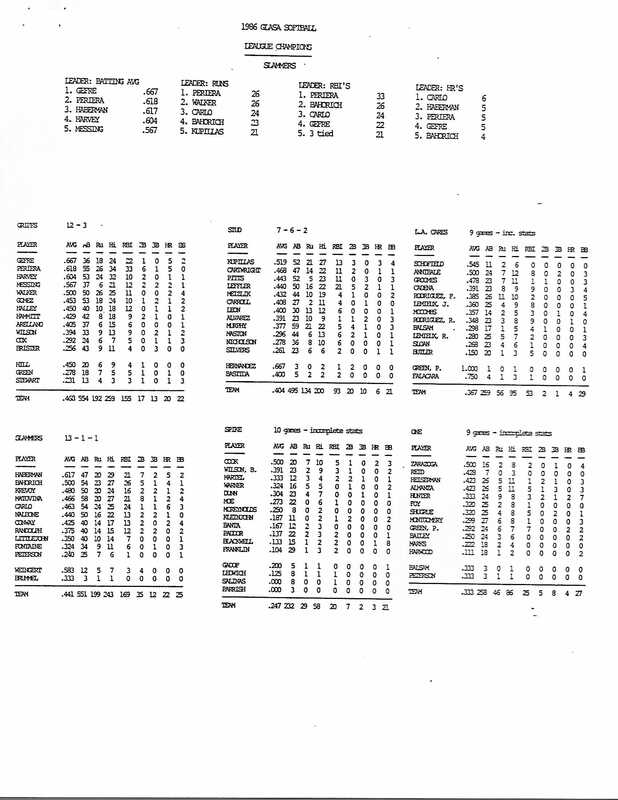 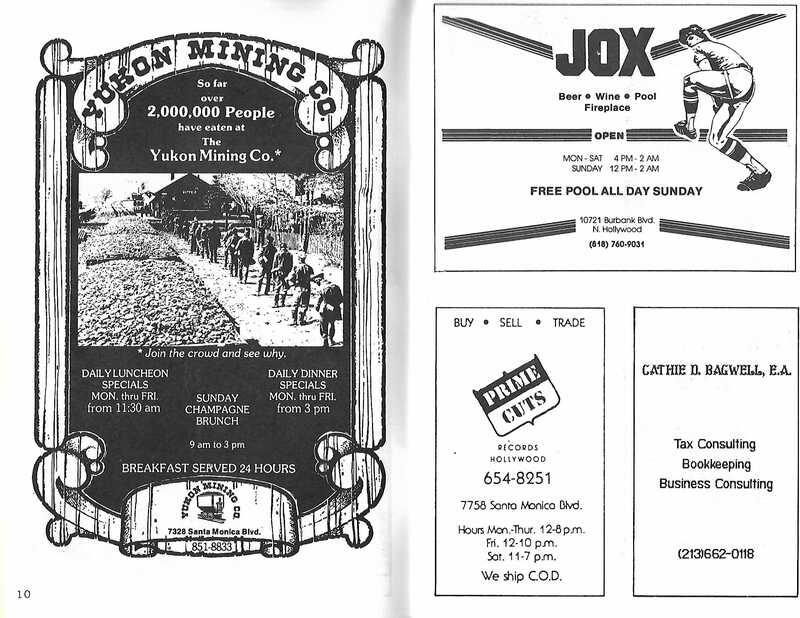 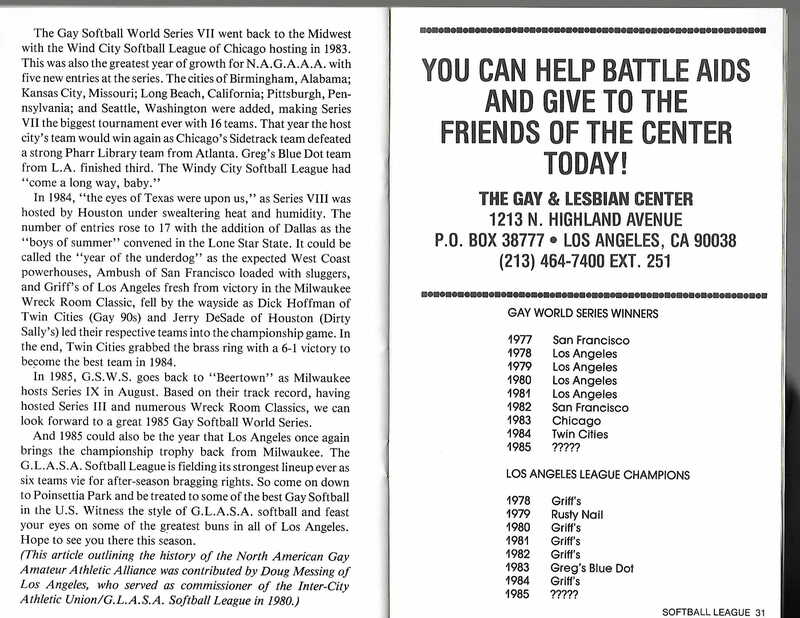 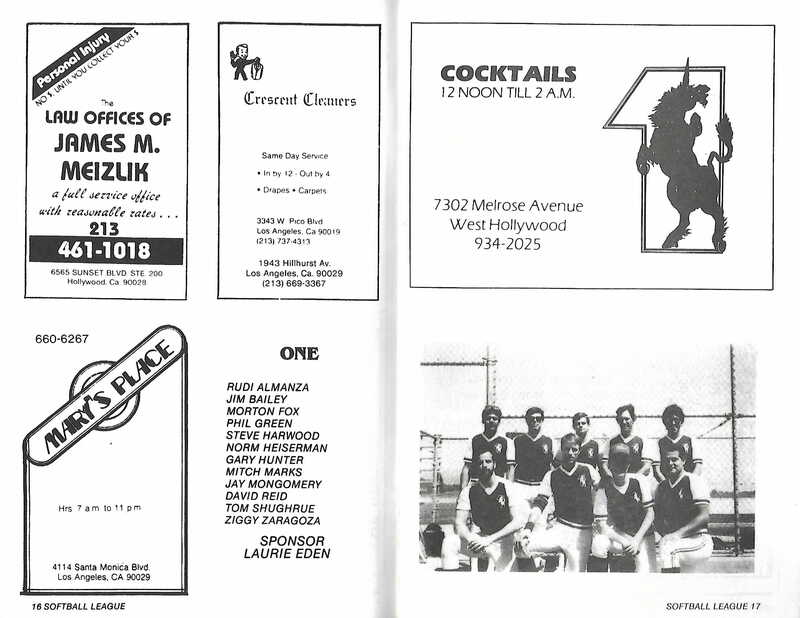 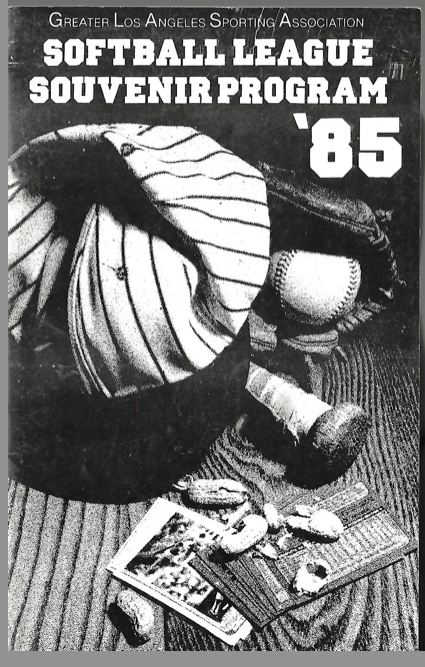 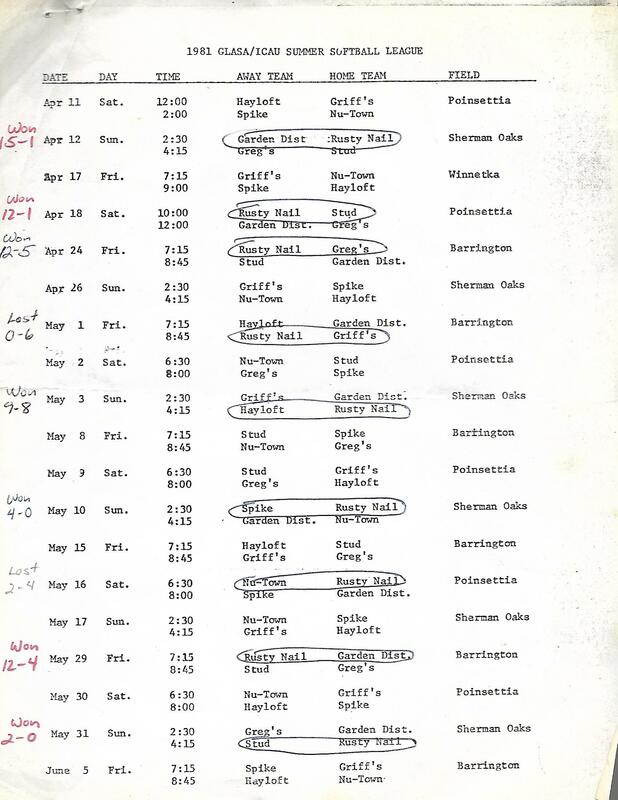 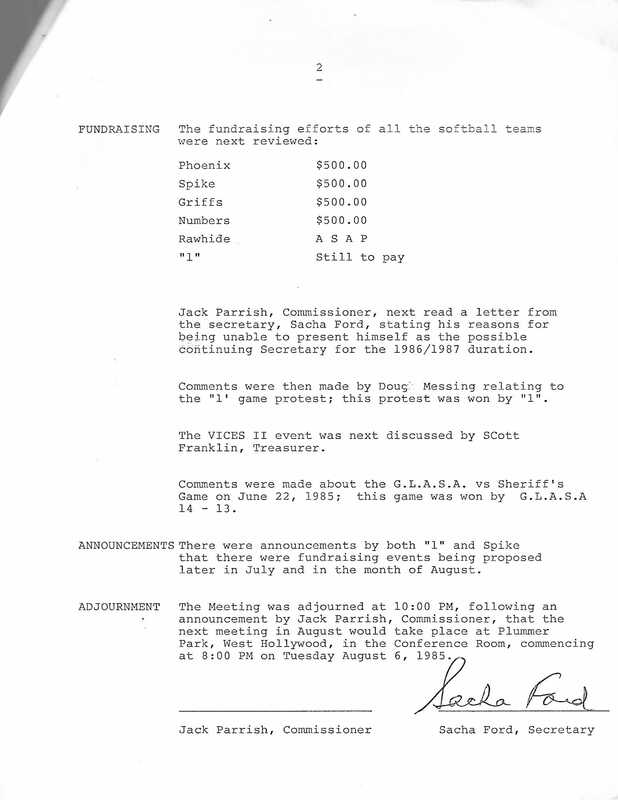 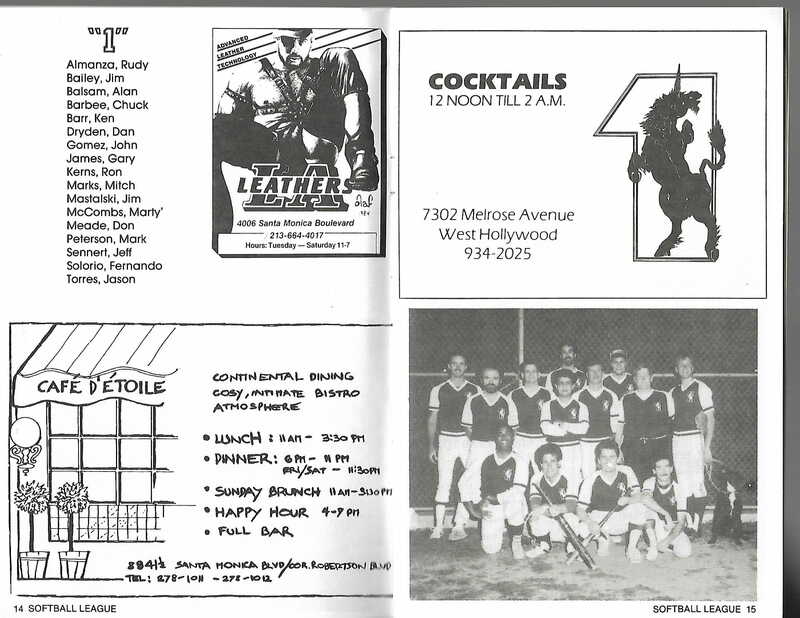 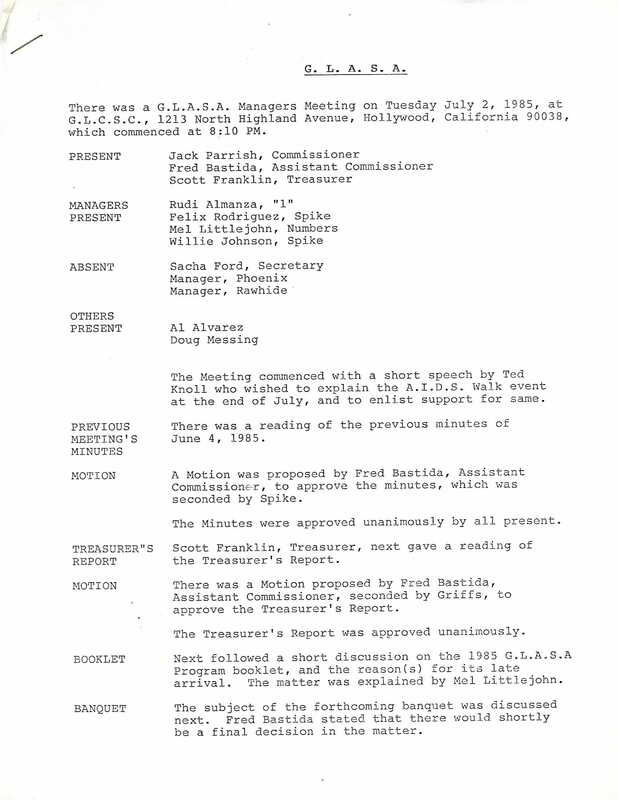 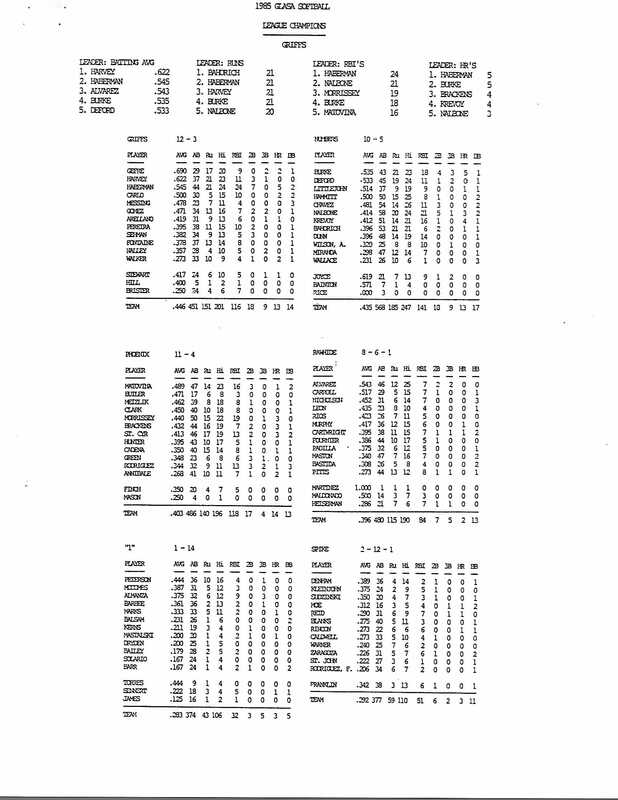 During our first year in 1978, the league was known as the Inter-City Athletic Union Softball League ("ICAU"). 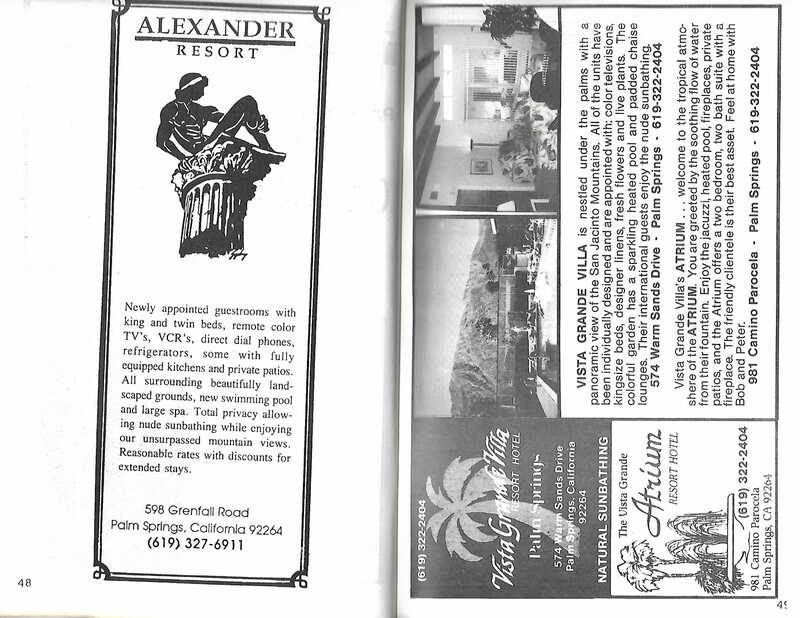 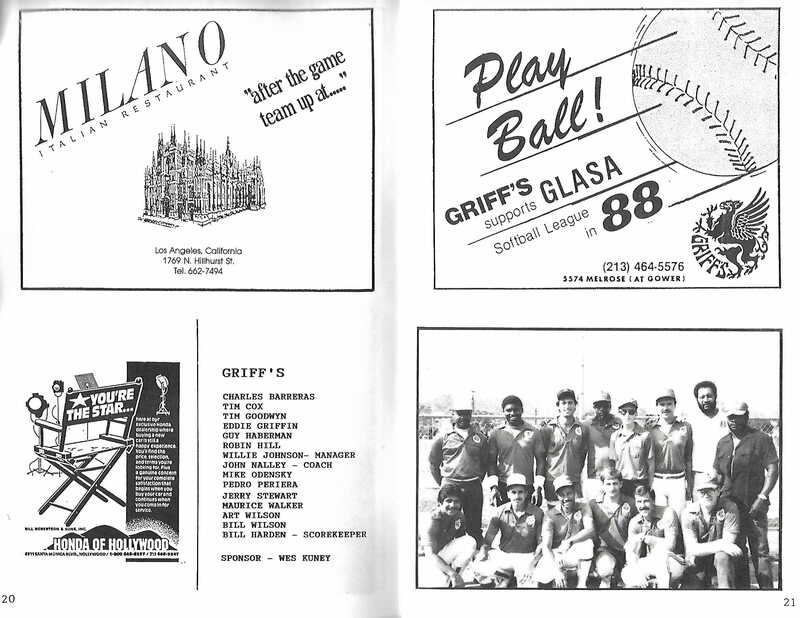 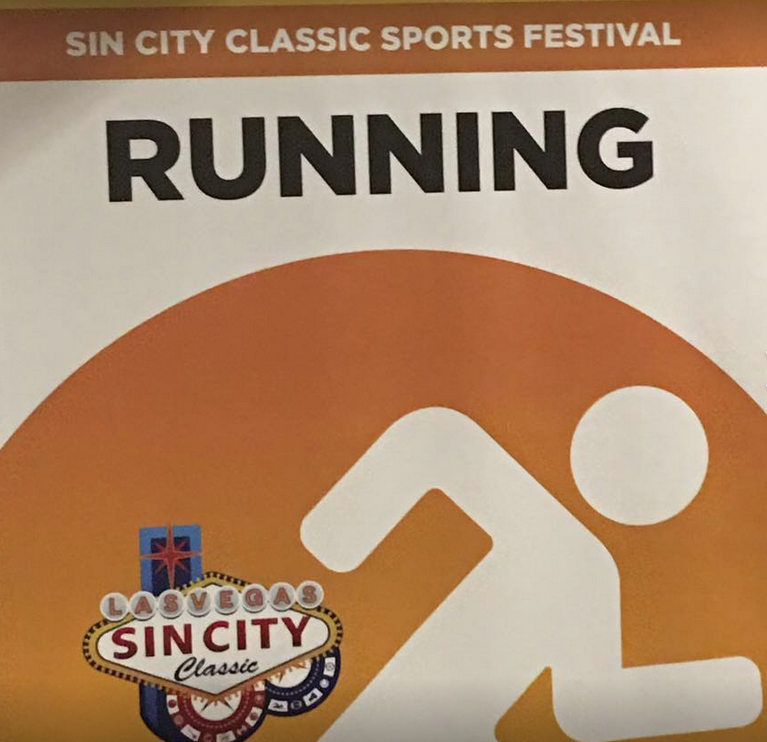 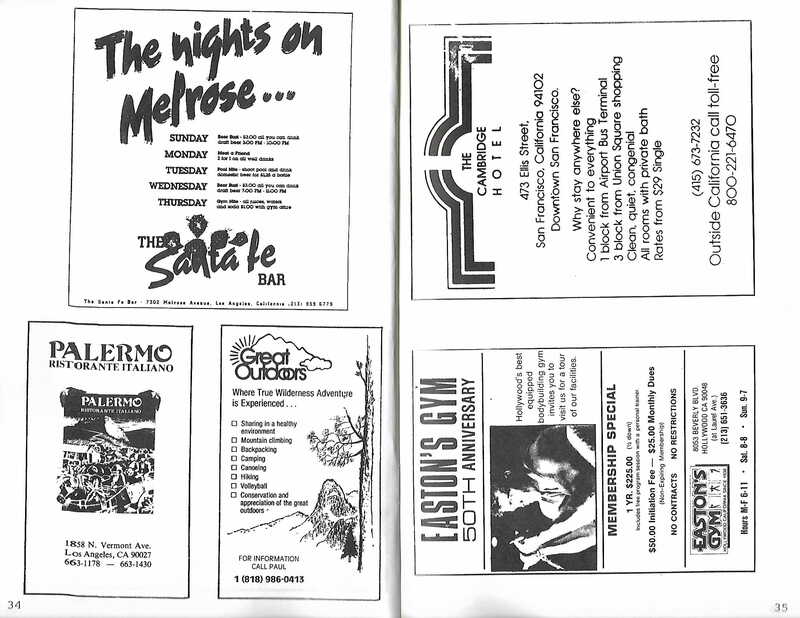 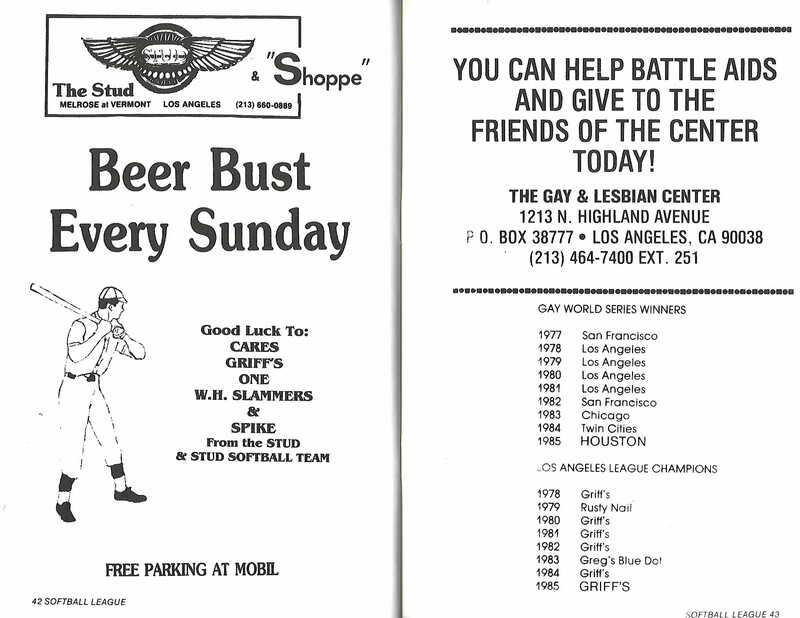 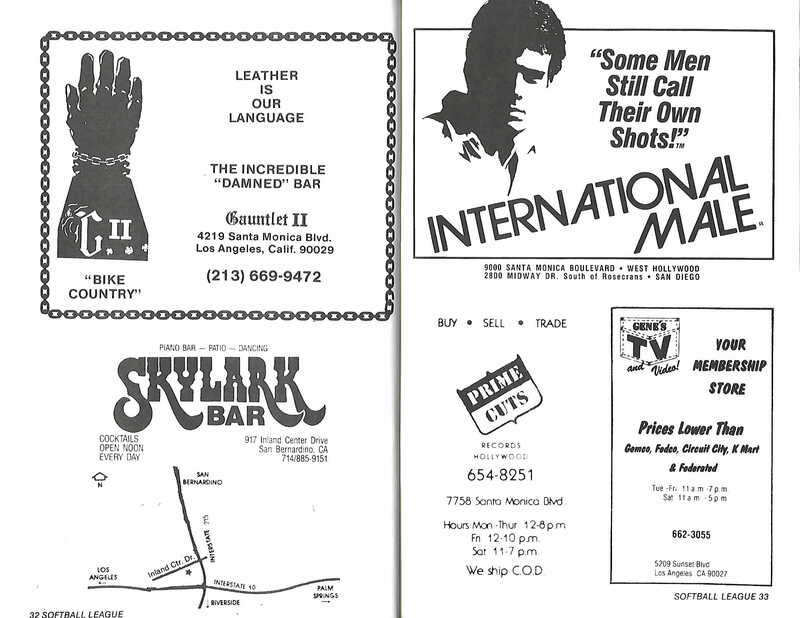 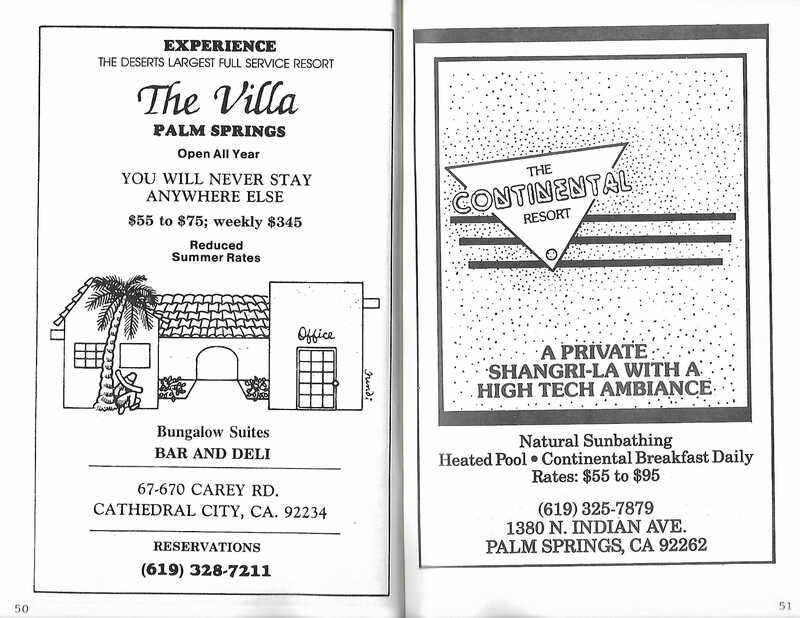 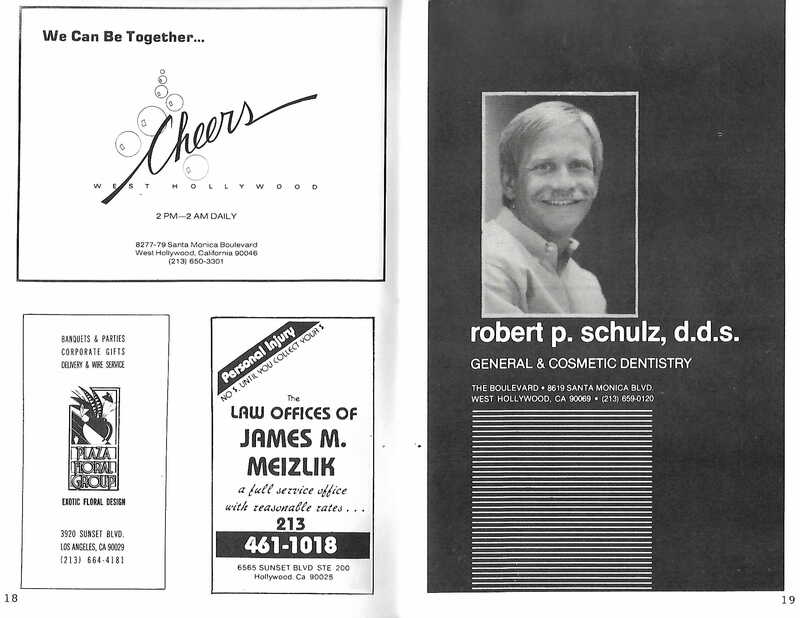 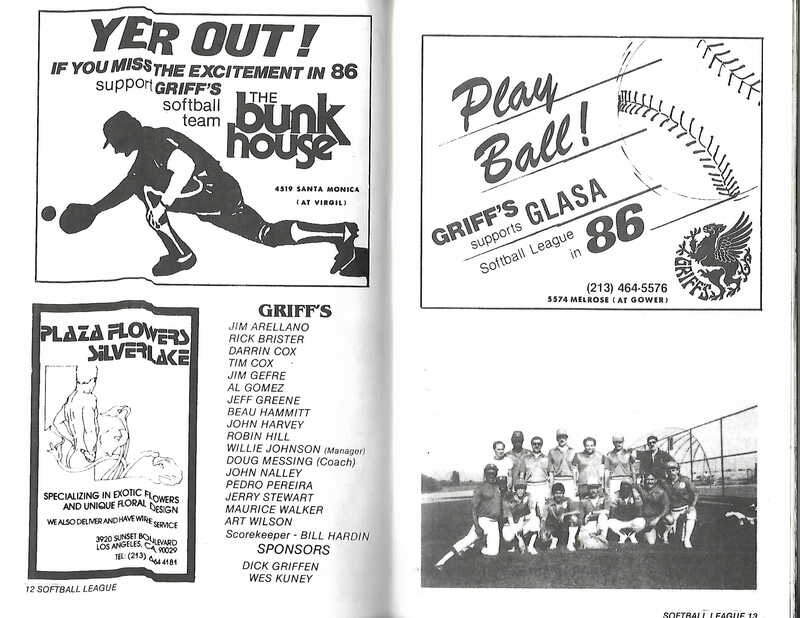 The six original charter teams were as Griffs, Rusty Nail, Gang Green, Latinos Unidos, Boots and Coast Times. 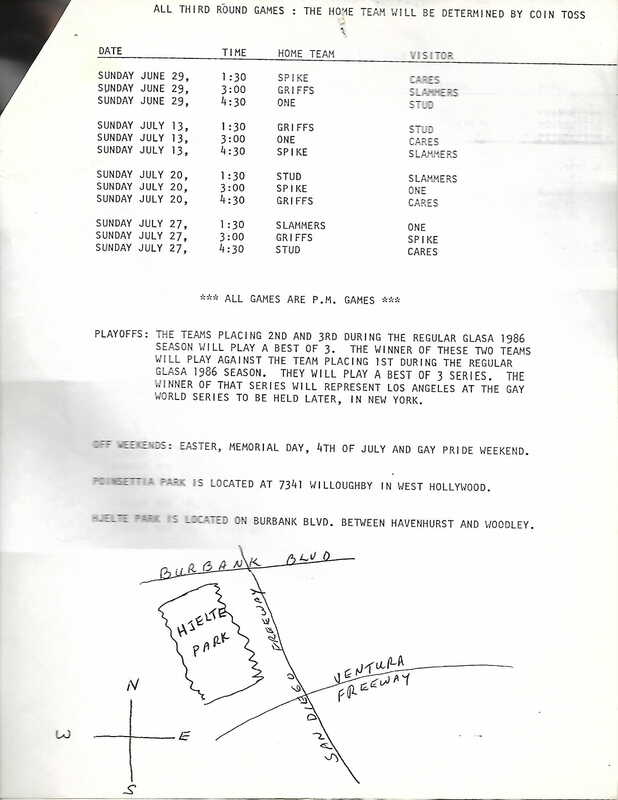 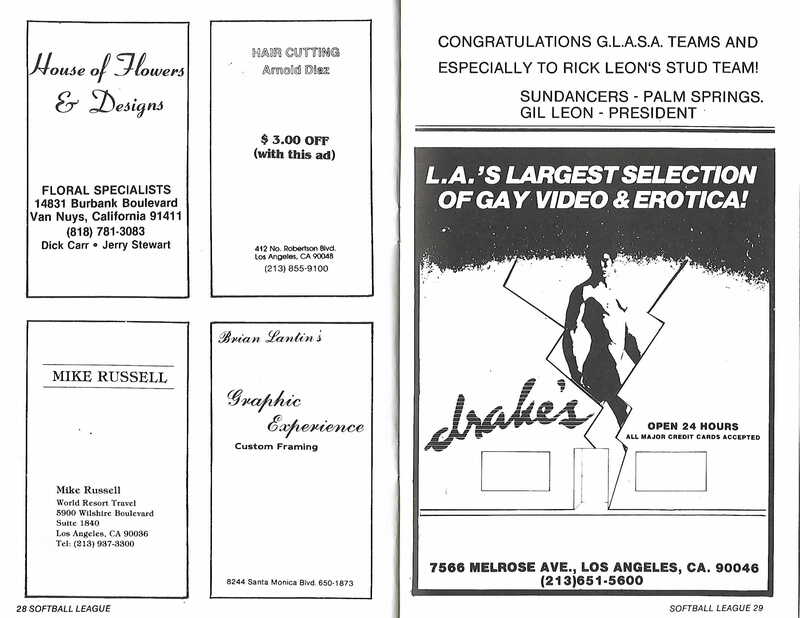 Games were played in one small field at West Hollywood Park in the middle of the gay district. 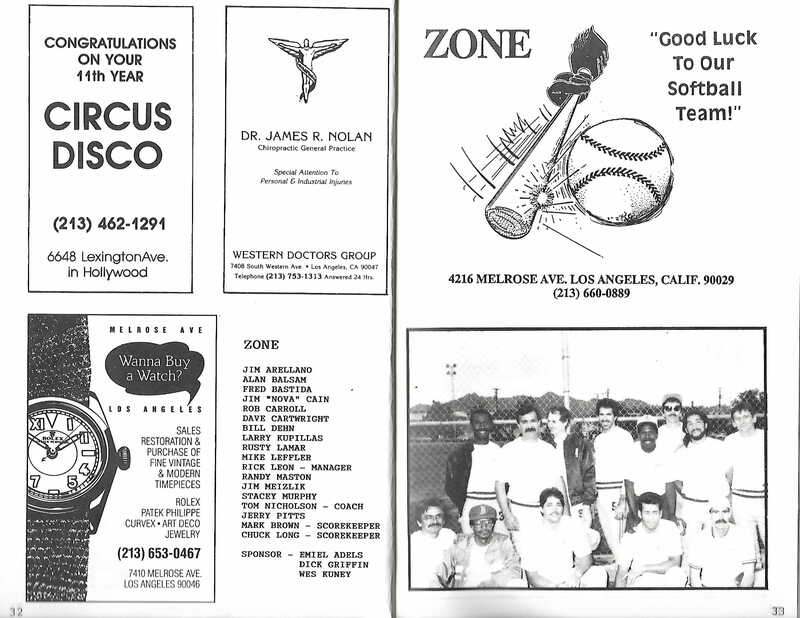 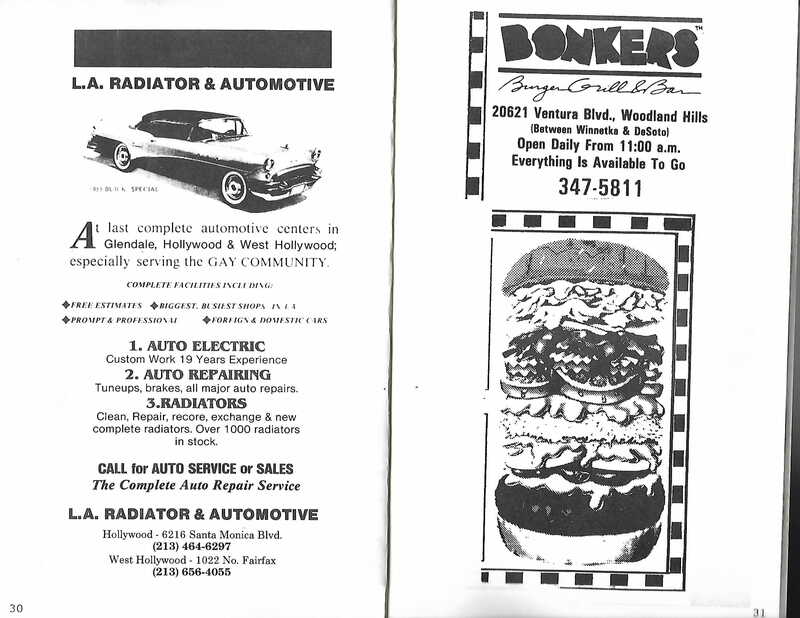 From those early beginnings, we have grown to over thirty teams. 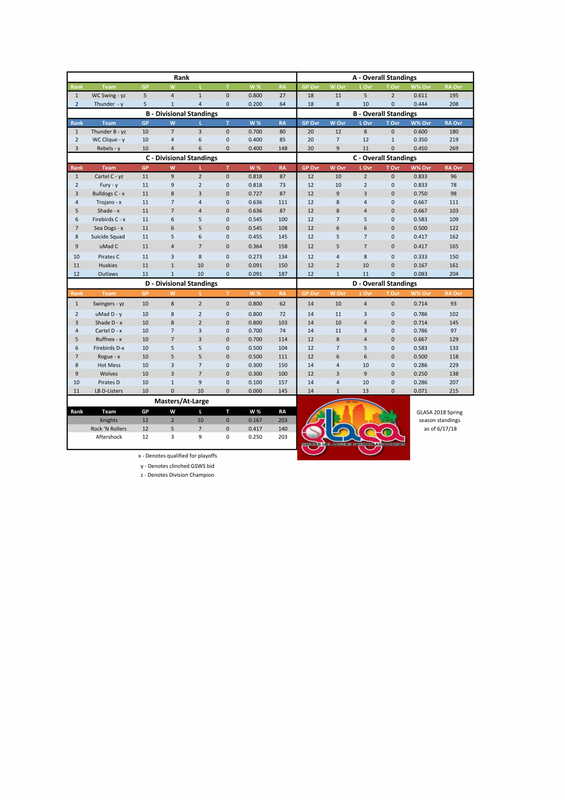 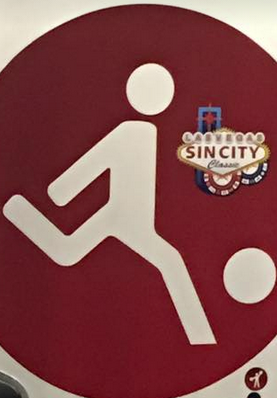 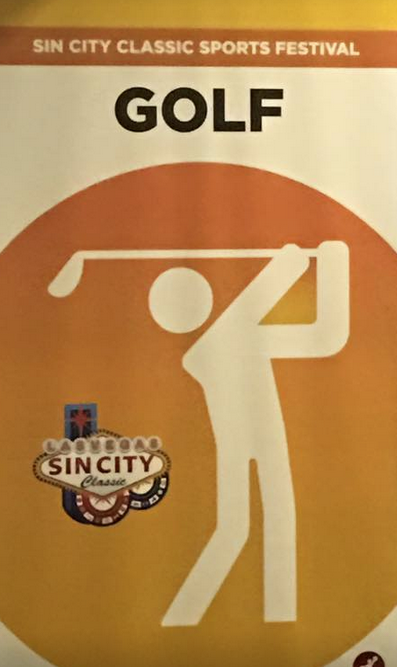 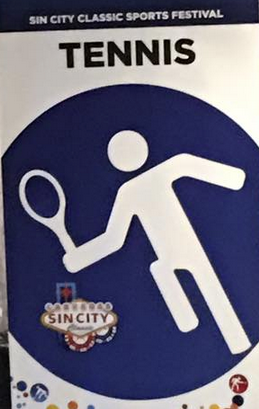 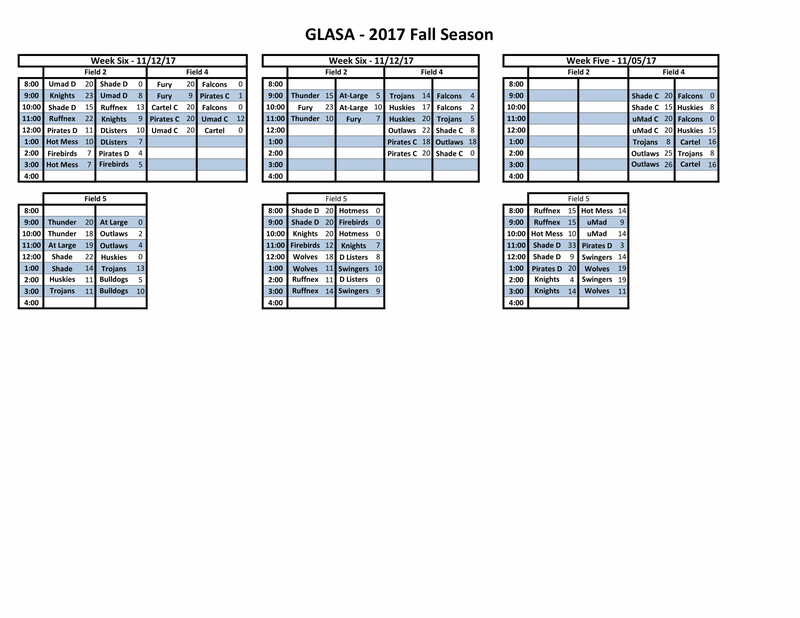 The league serves over 600 athletes playing in both a spring and fall season. 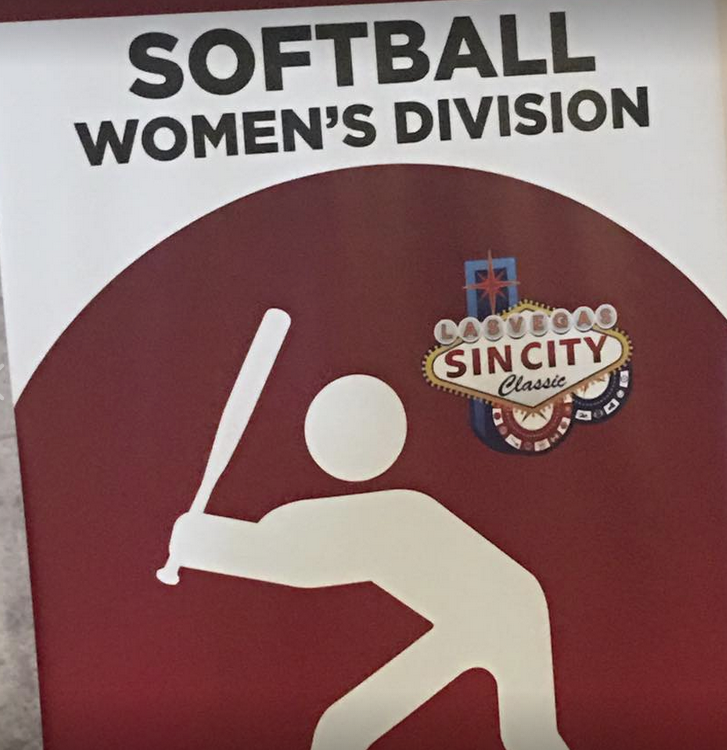 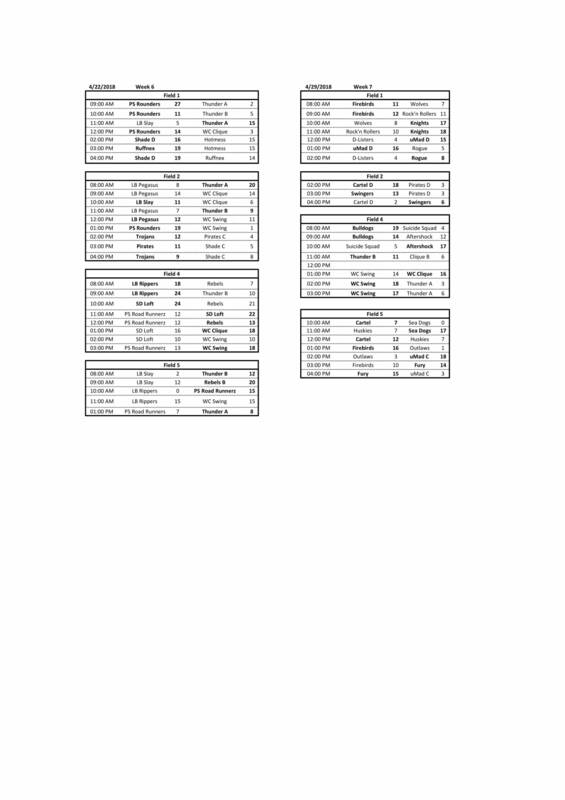 We have expanded from the one division of competition to four divisions of softball participation. 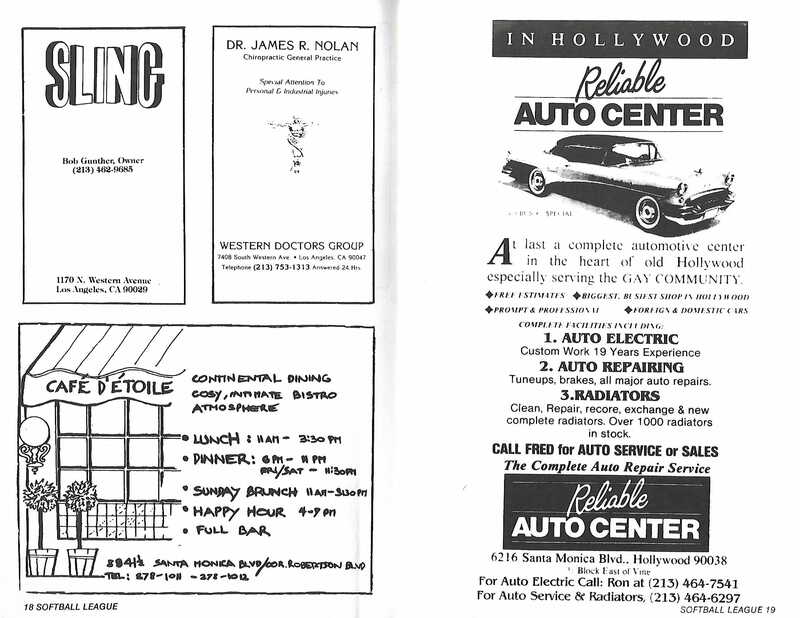 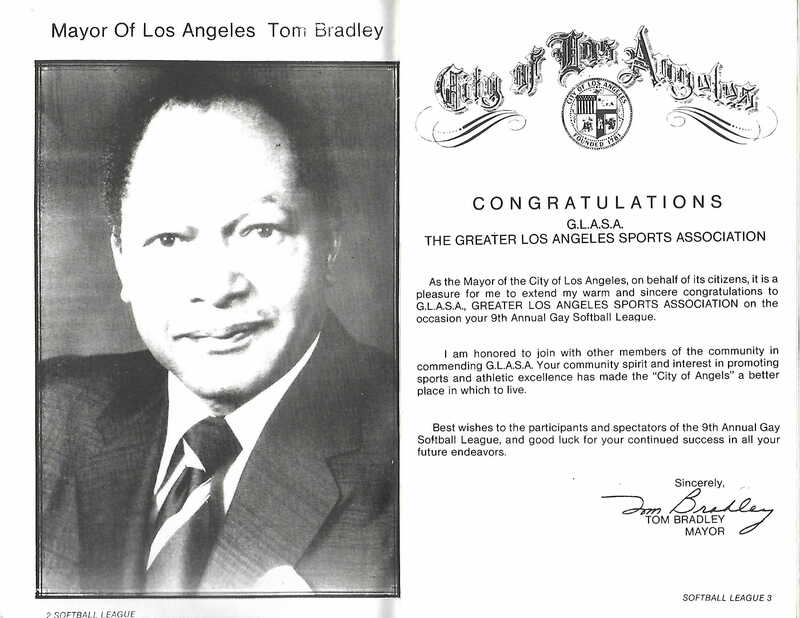 The make-up of the league is very diverse and mirrors the demographics of the Greater Los Angeles area. 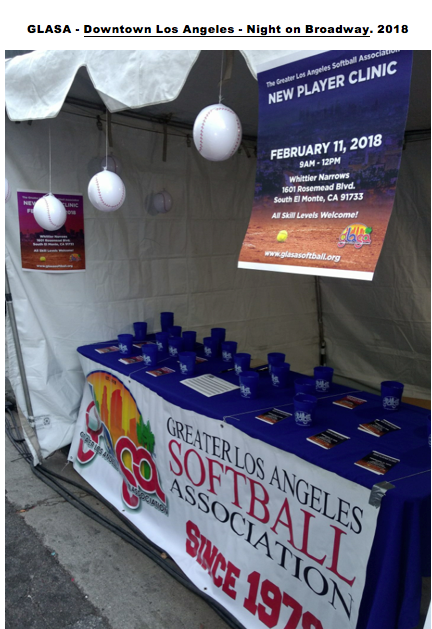 League membership ranges in age from 18 to 65 years of age and is comprised of people who are in college, just starting their careers, well established work professionals, high powered executives and also just the average Angelino. 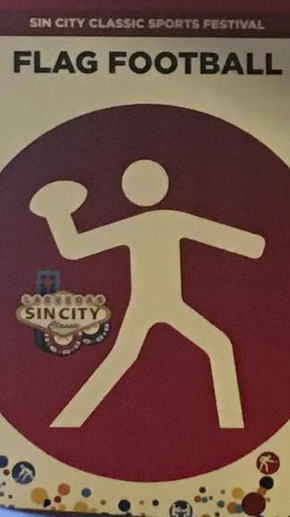 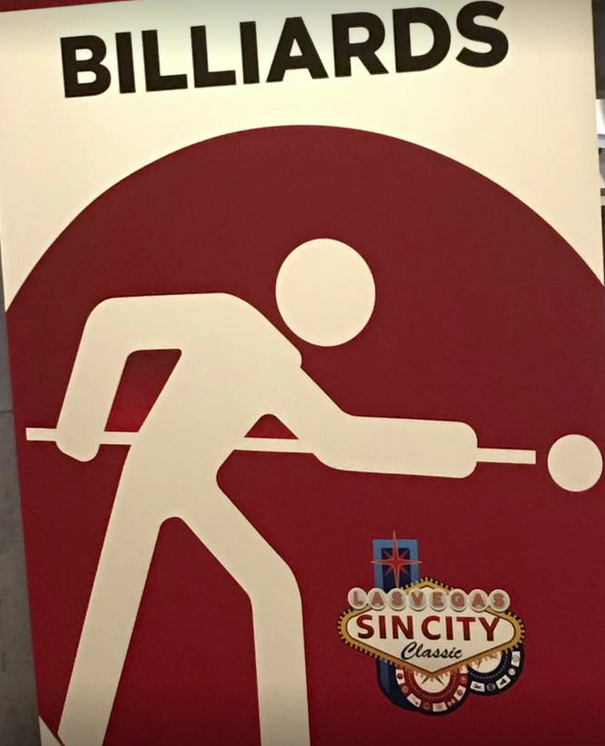 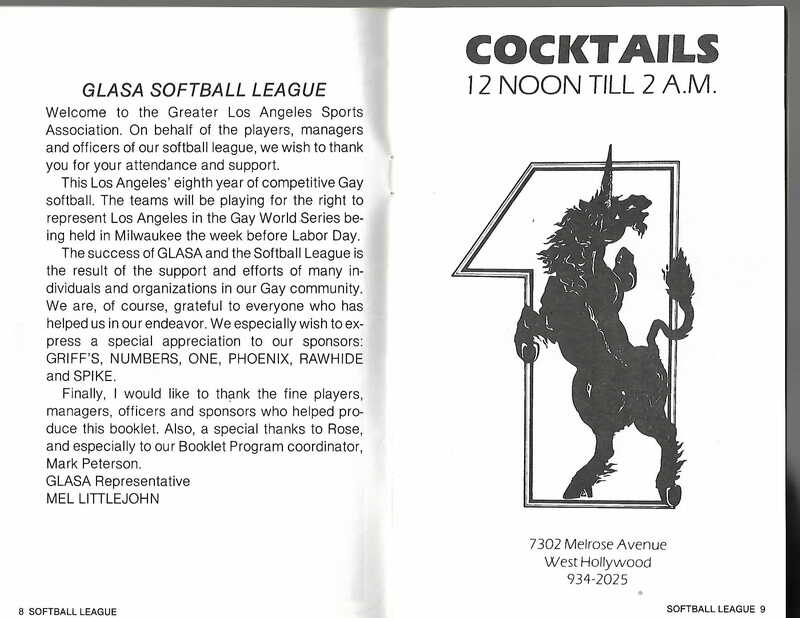 Whatever their status in life, all players are welcome in our league. 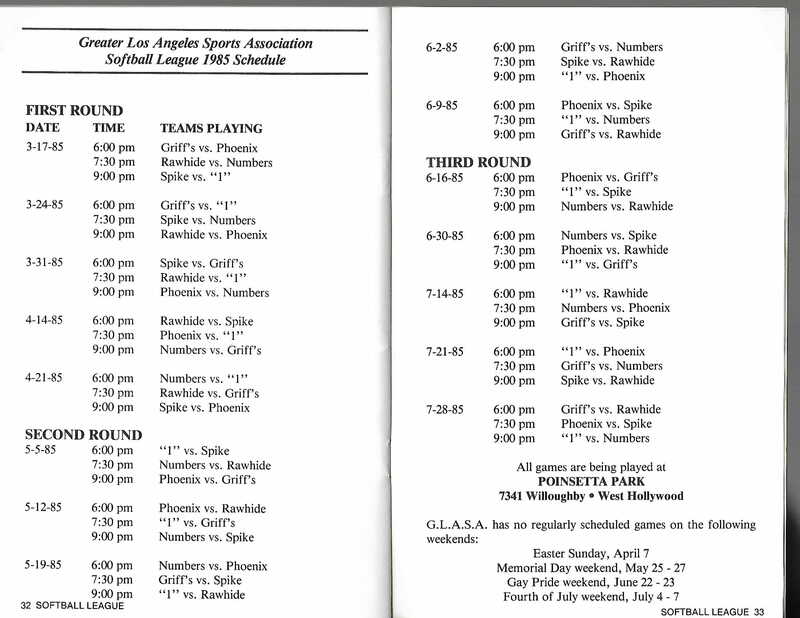 We currently play our league games on Sundays in beautiful Whittier Narrows Park , on four separate fields. 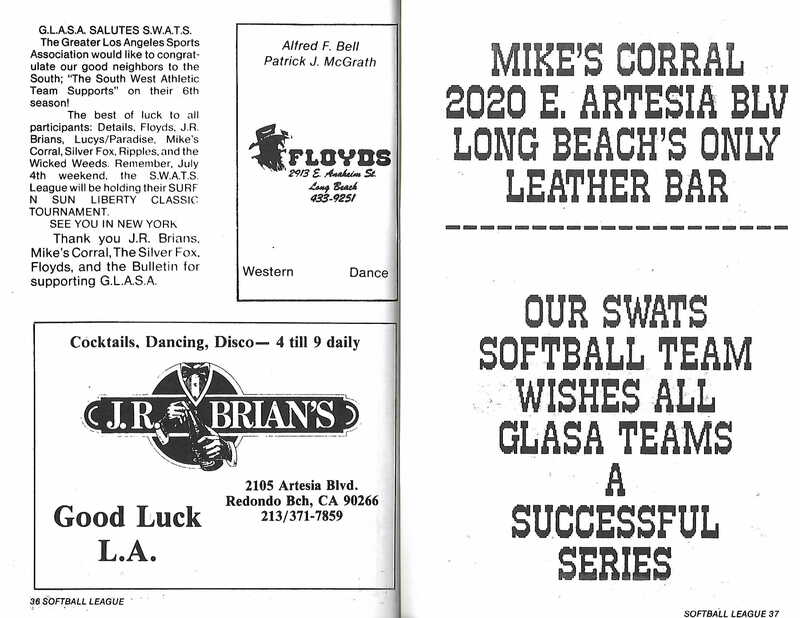 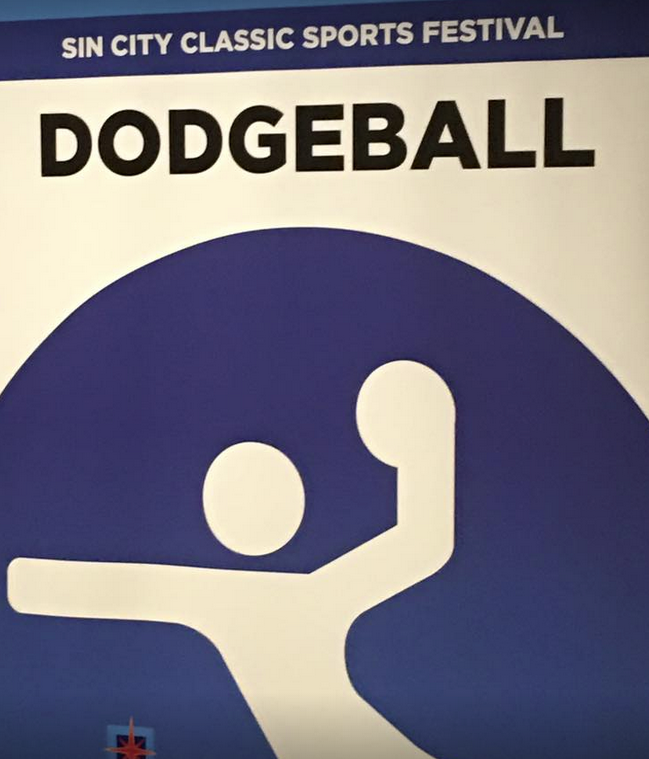 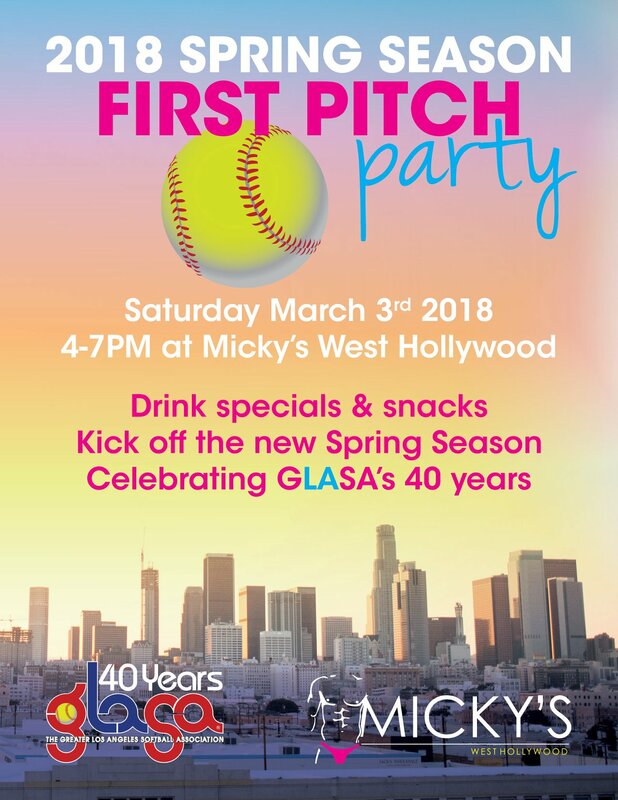 Each year, GLASA holds a switch-hitter's fundraiser that attracts an attendance of over 500 people and raises about $15,000 to support the teams going to the GSWS. 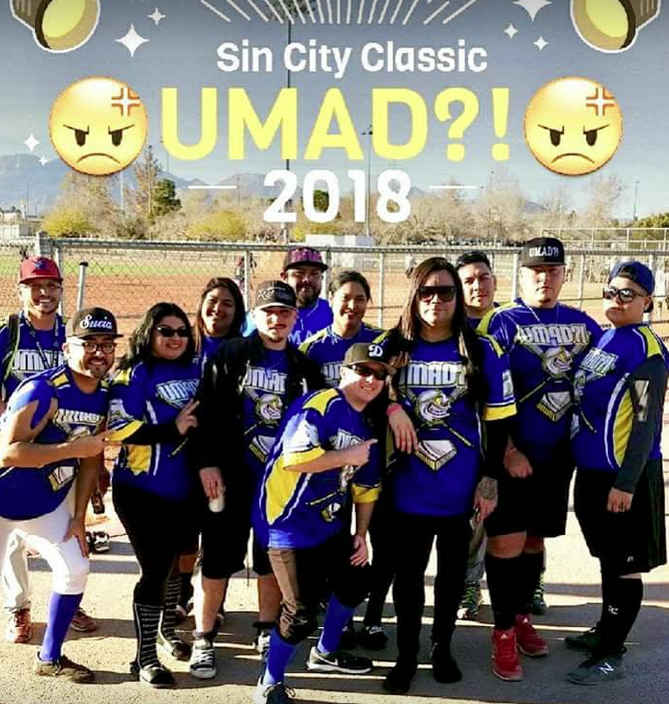 Local celebrities are invited to come out and judge the event. 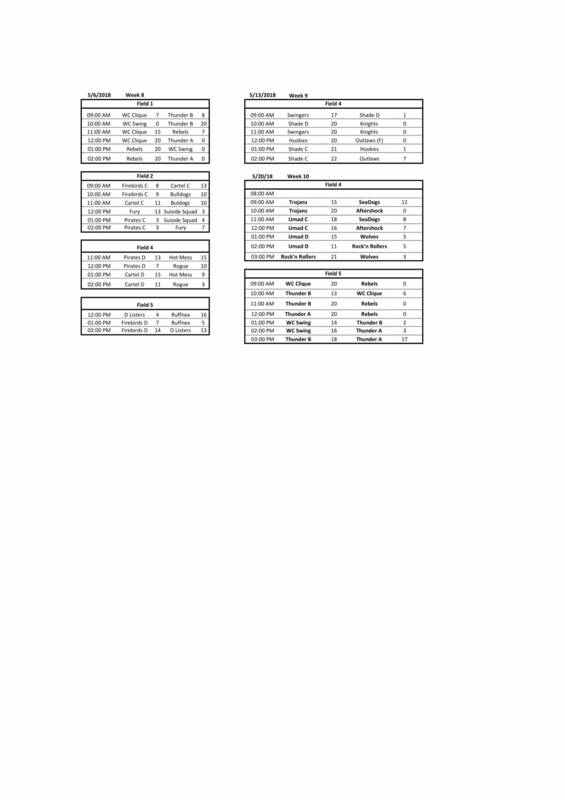 At its inception into NAGAAA, only one division existed in which the athletes participated. 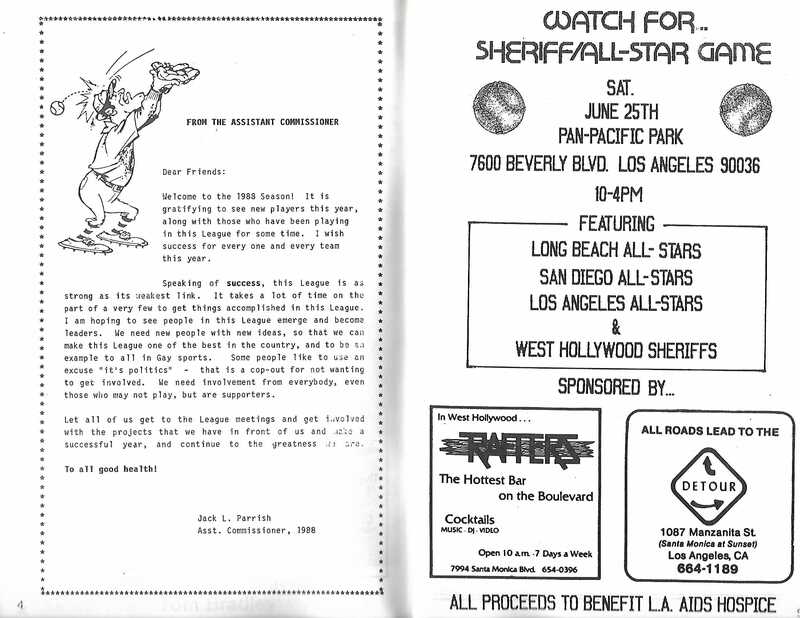 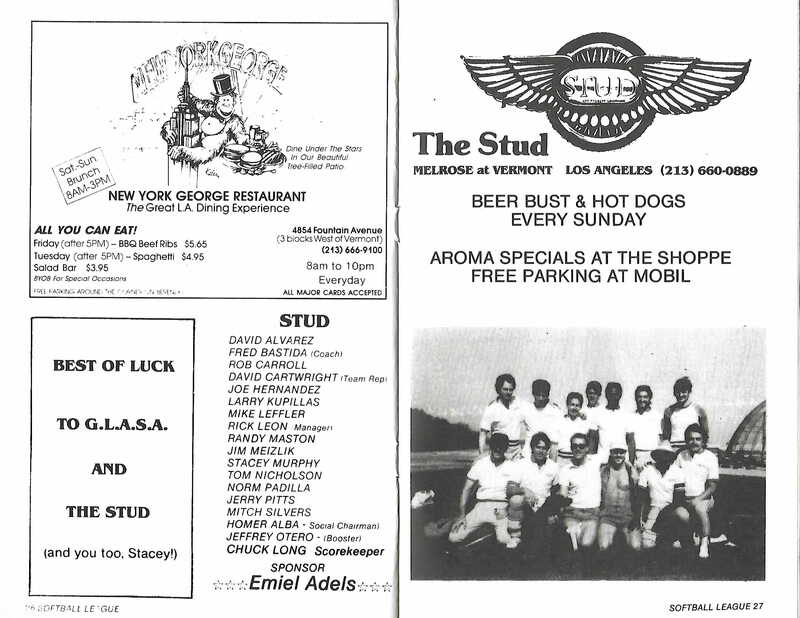 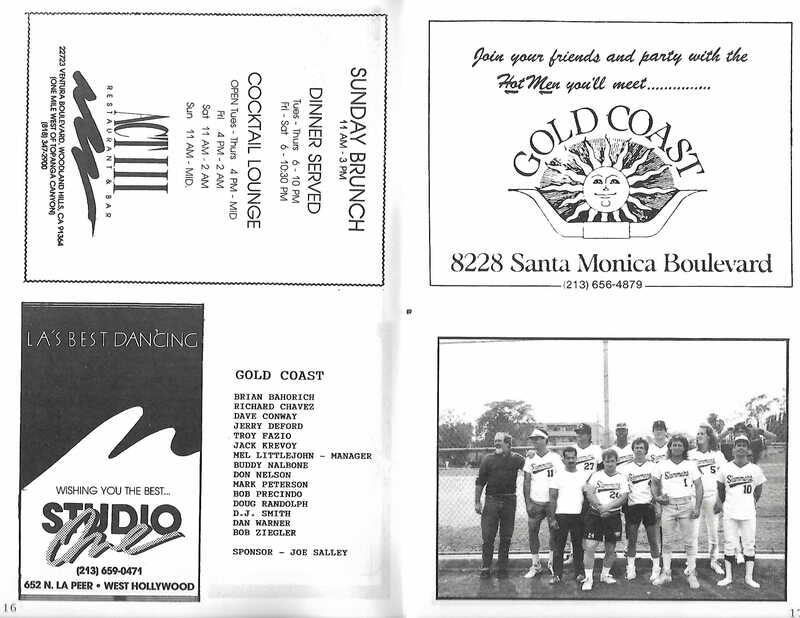 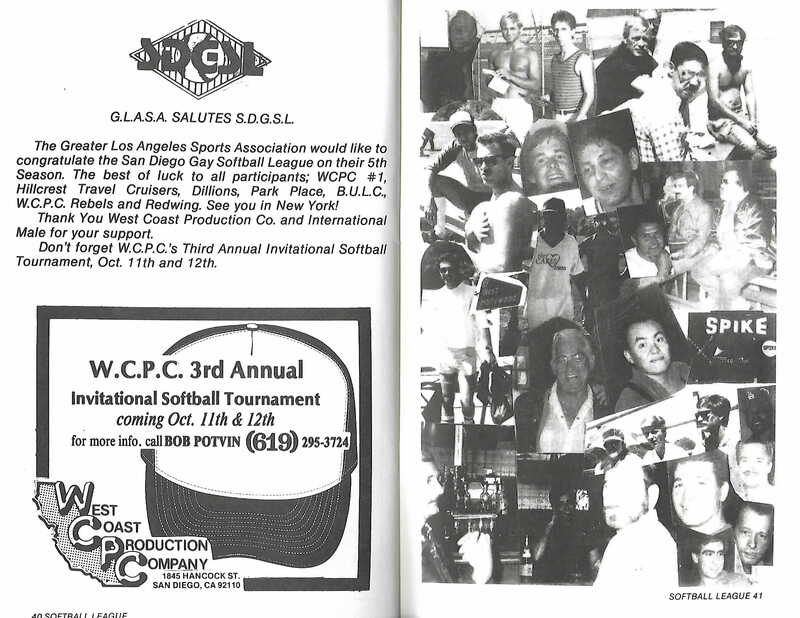 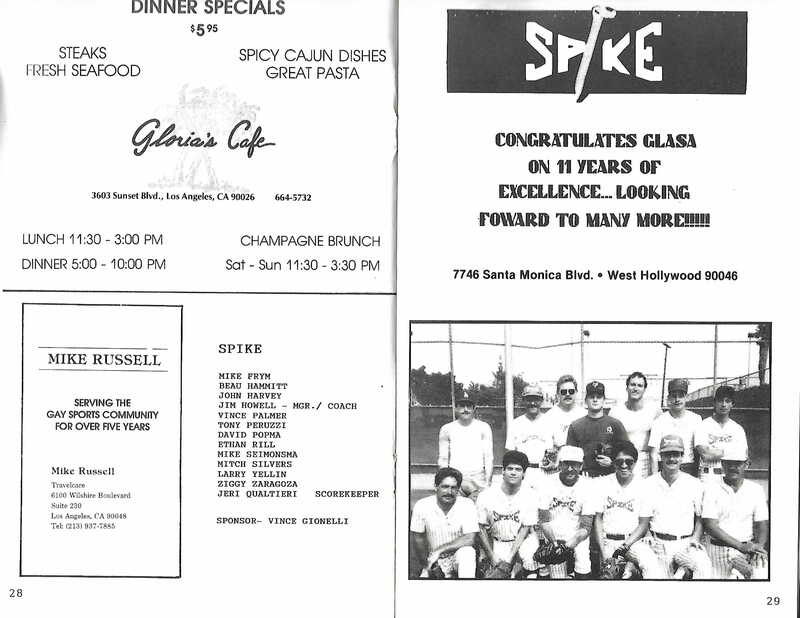 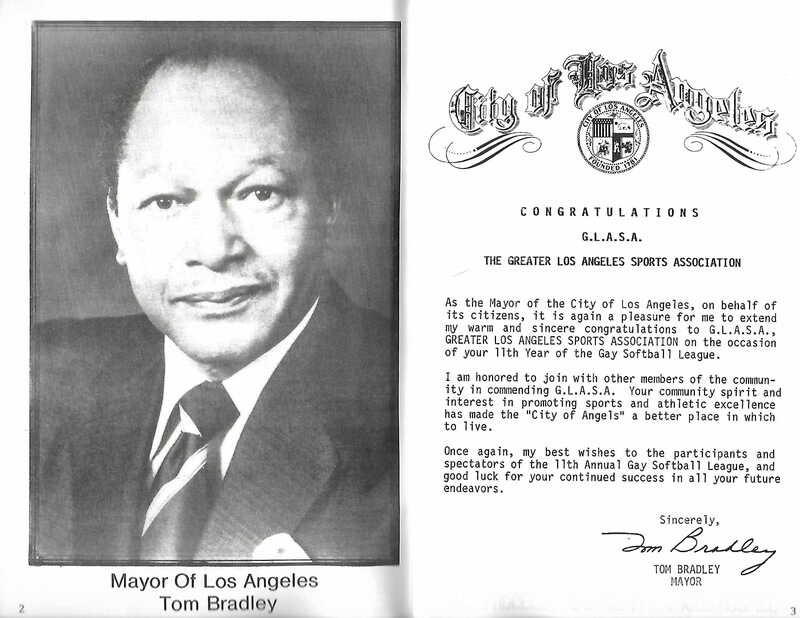 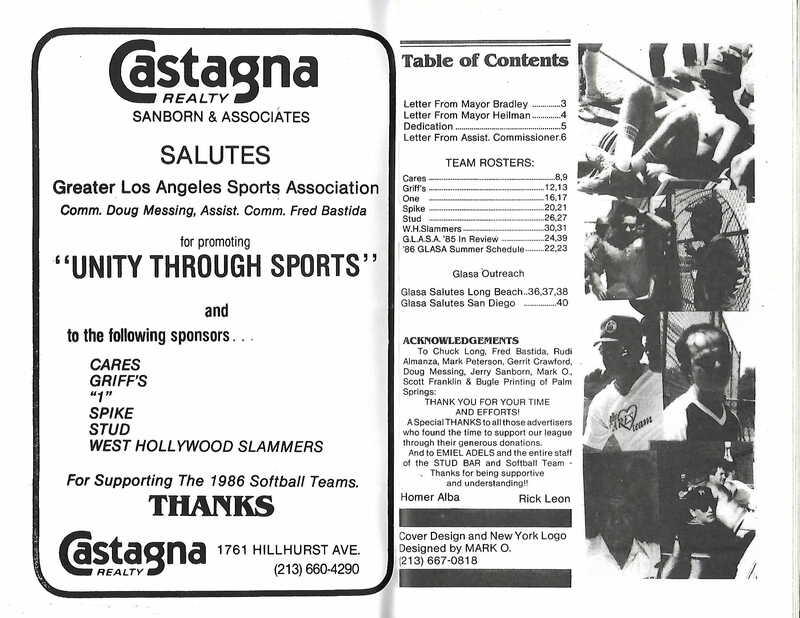 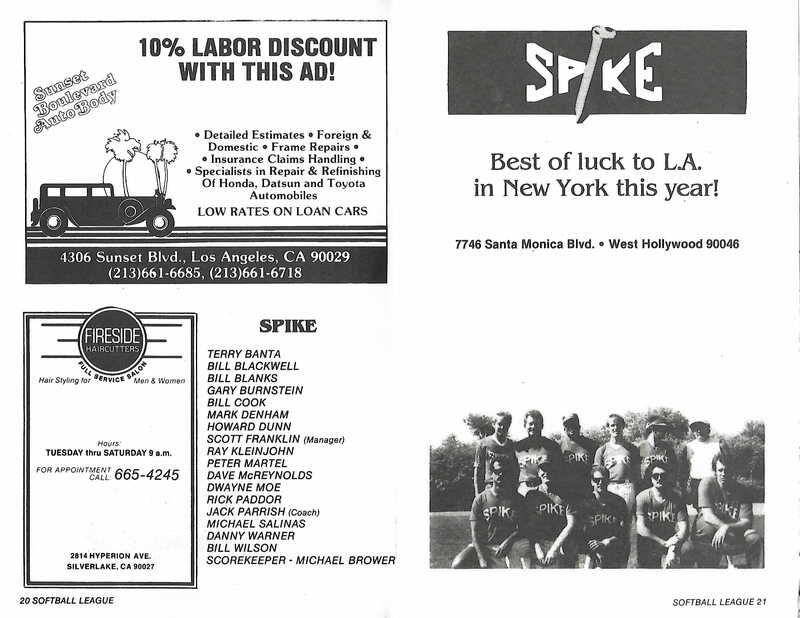 From that simple beginning, Los Angles established itself as a league of champions by winning the first four Gay Softball World Series in which it participated. 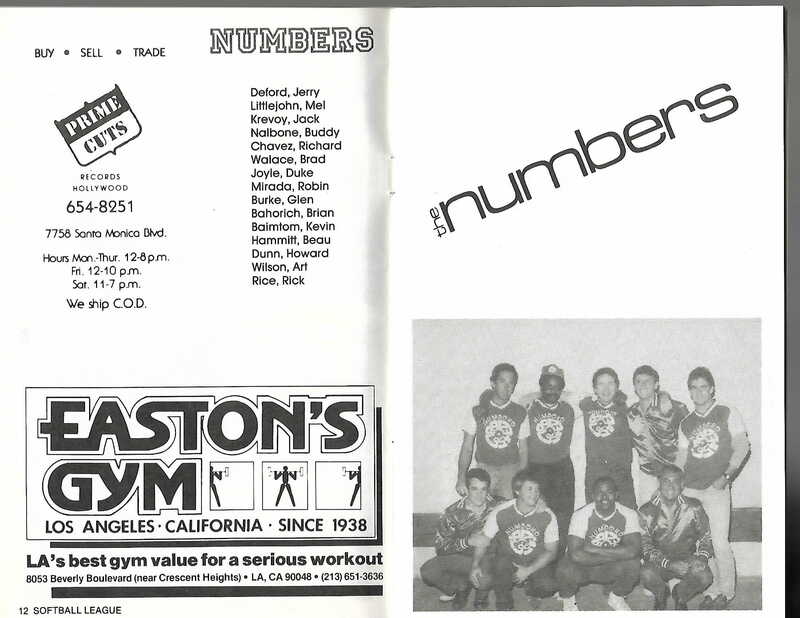 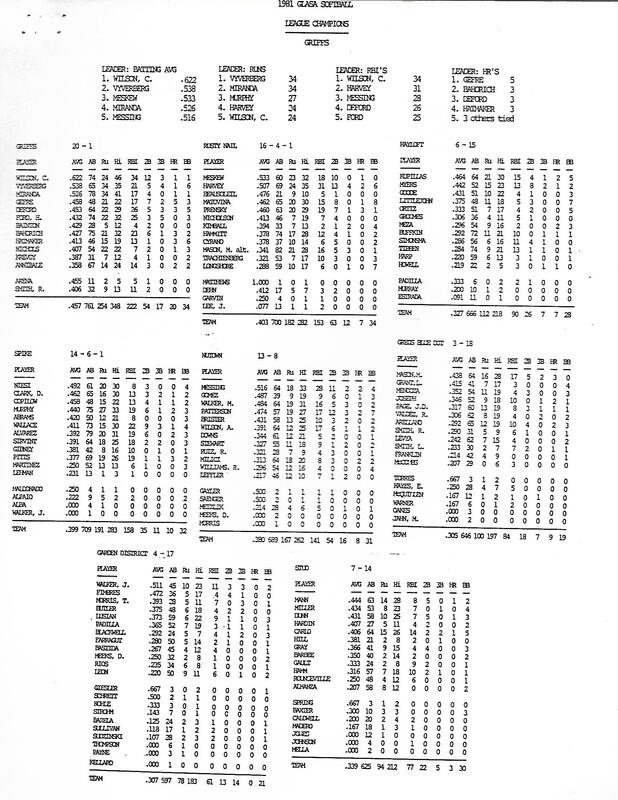 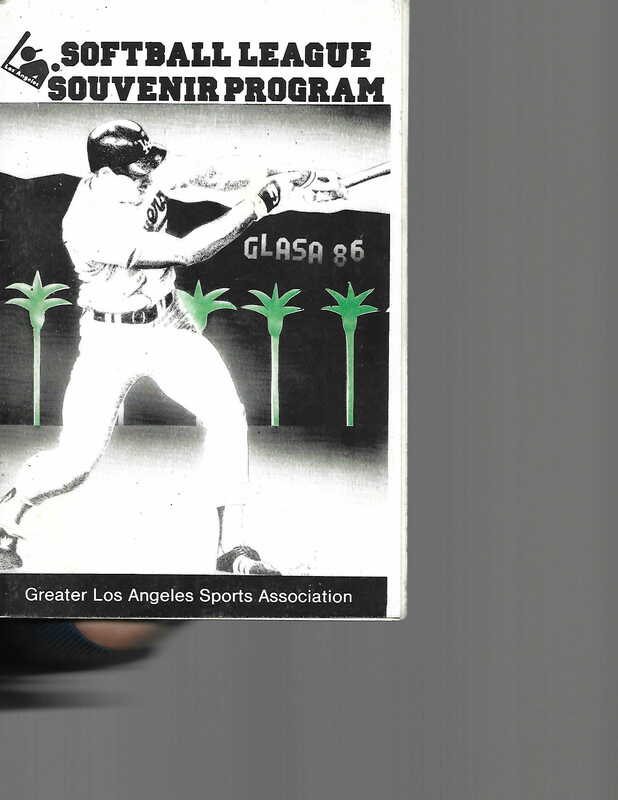 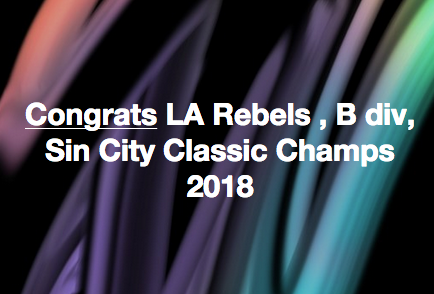 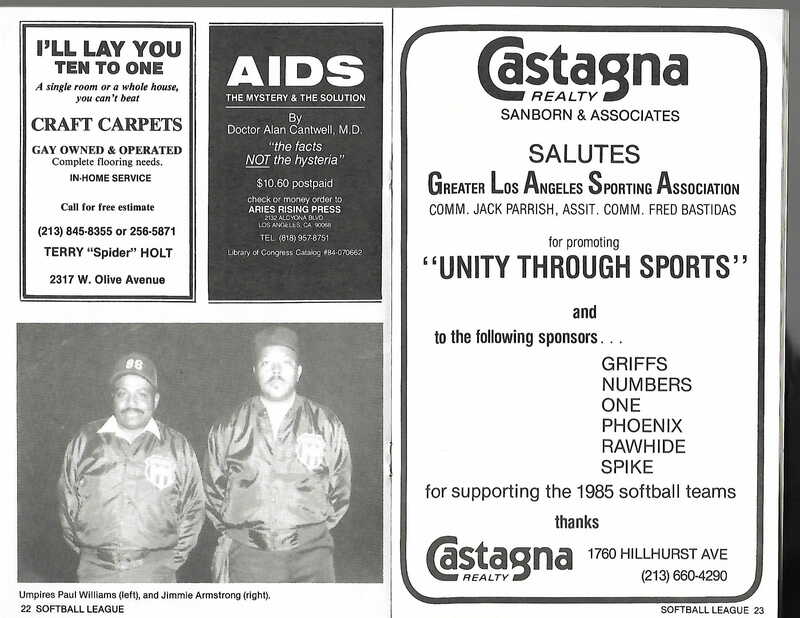 Overall, Los Angeles has won 19 "A" division championships, with Griffs finishing with five titles, one each by Rusty Nail in 1979 and Slammers in 1986 and the LA Stray Cats winning an unprecedented 10 in a row from 1994 through 2003. 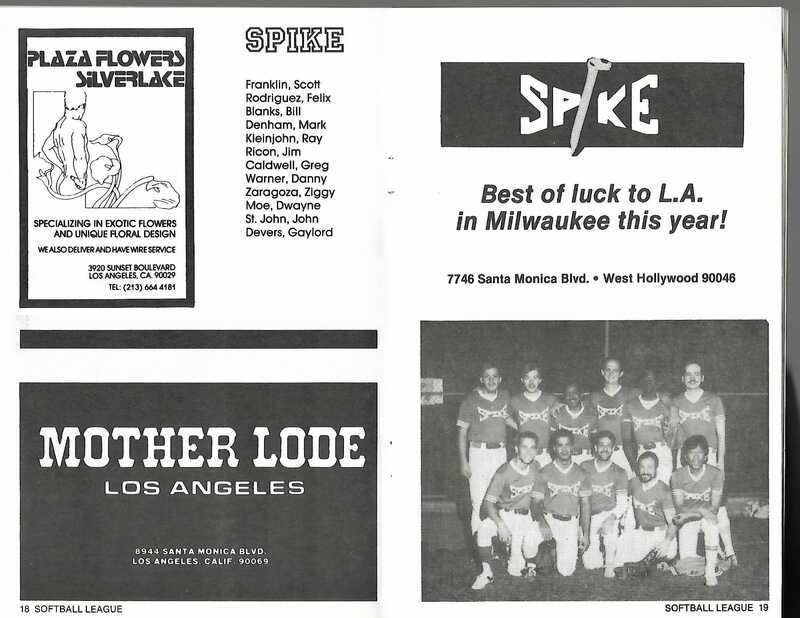 LA Vipers has continued the tradition, winning in 2005 and 2006. 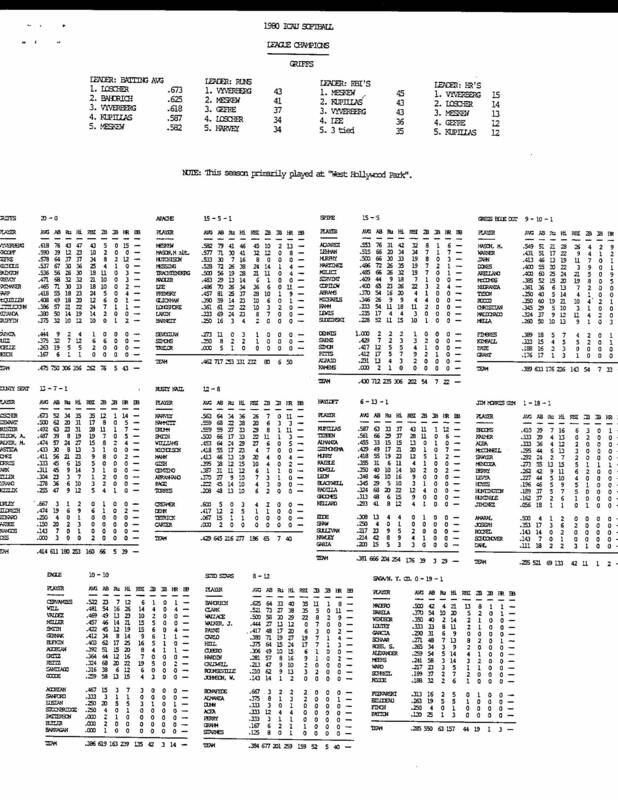 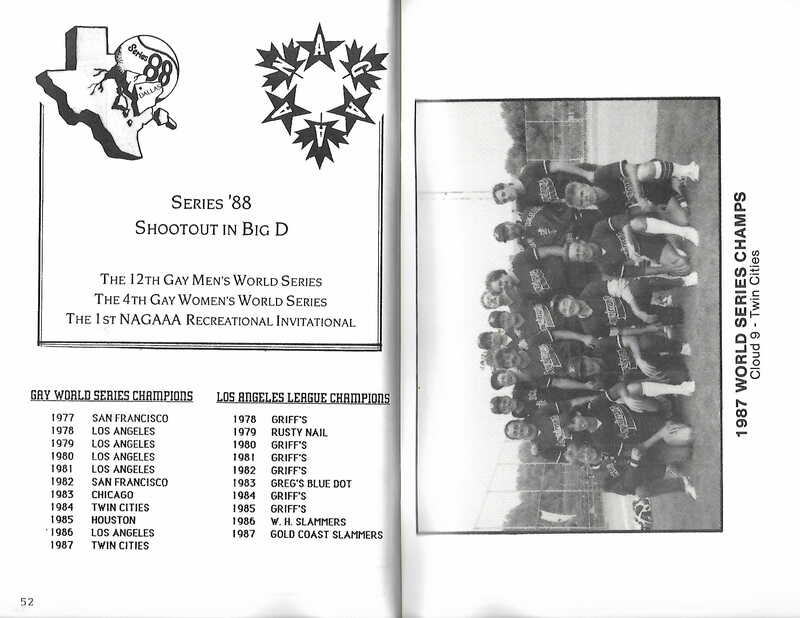 In 1988, NAGAAA created a second division, today known as the "B" division. 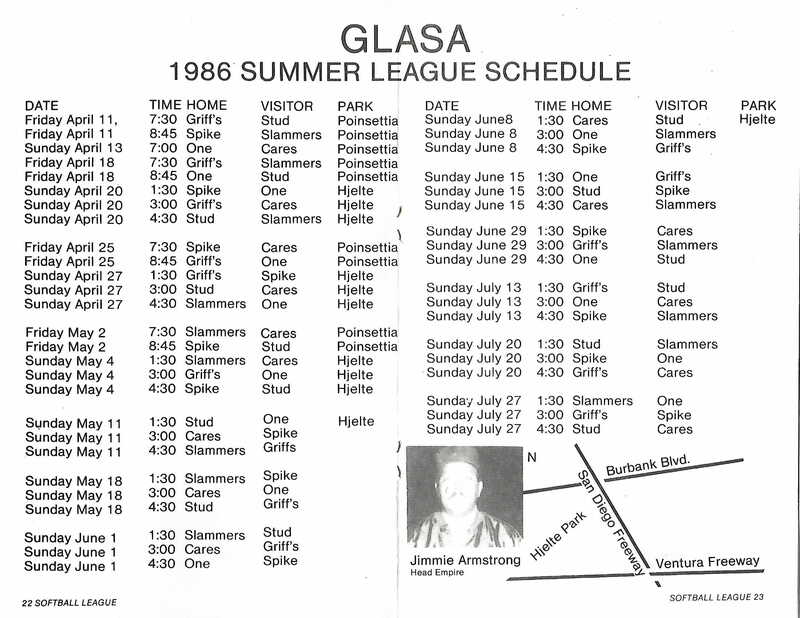 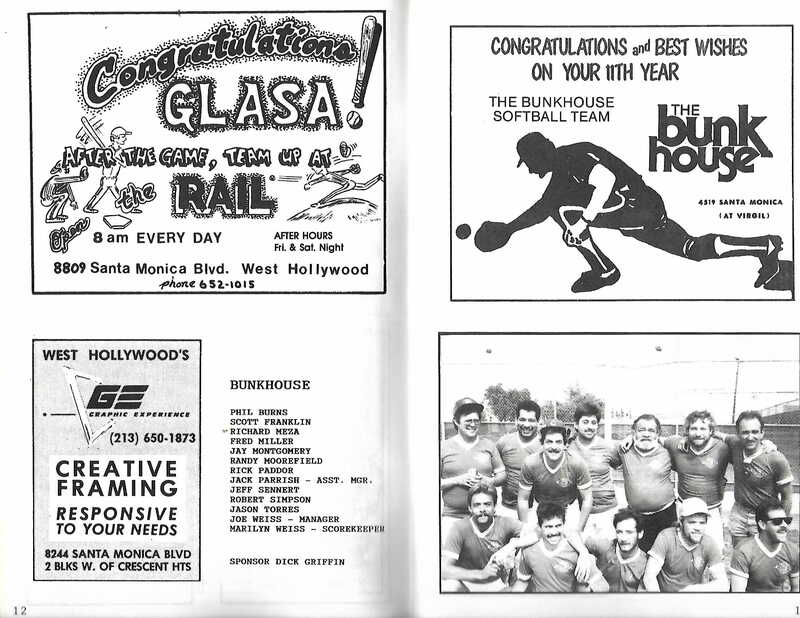 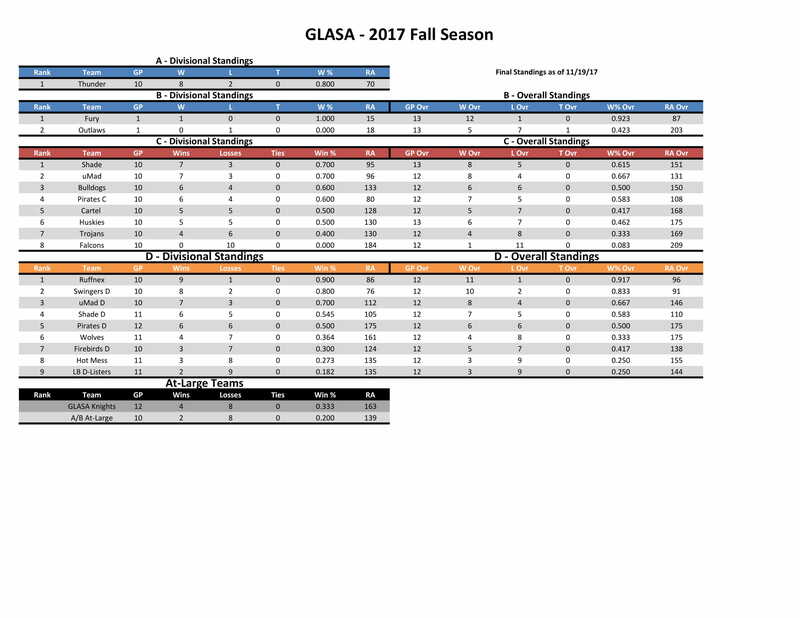 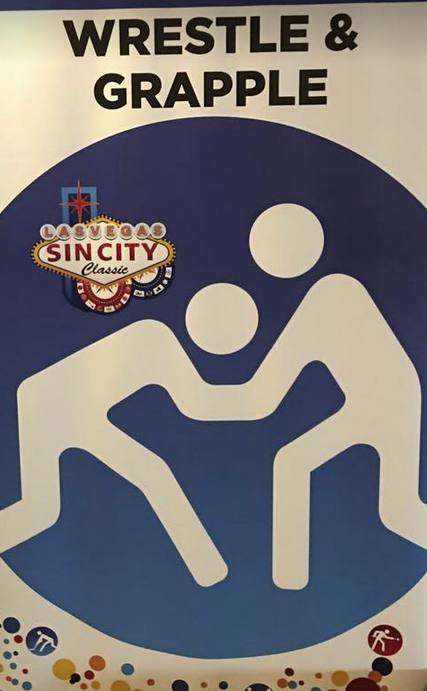 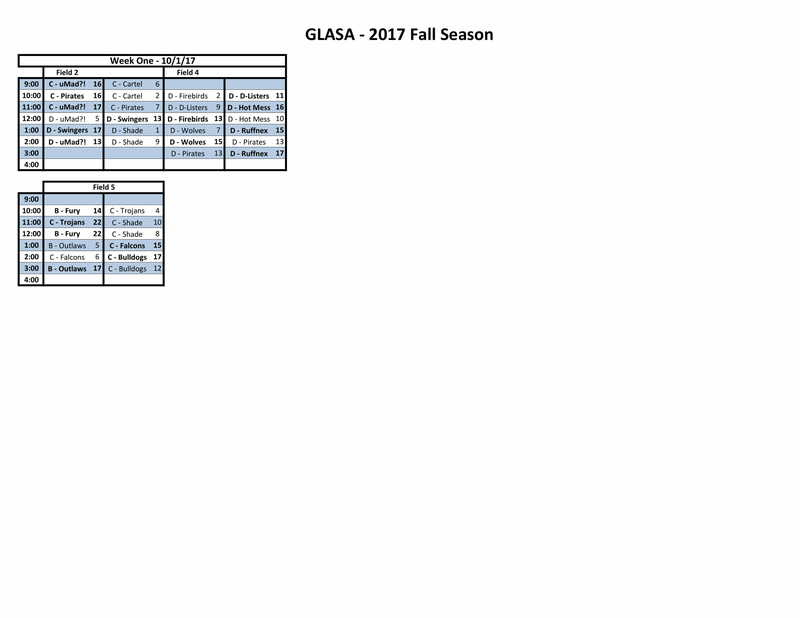 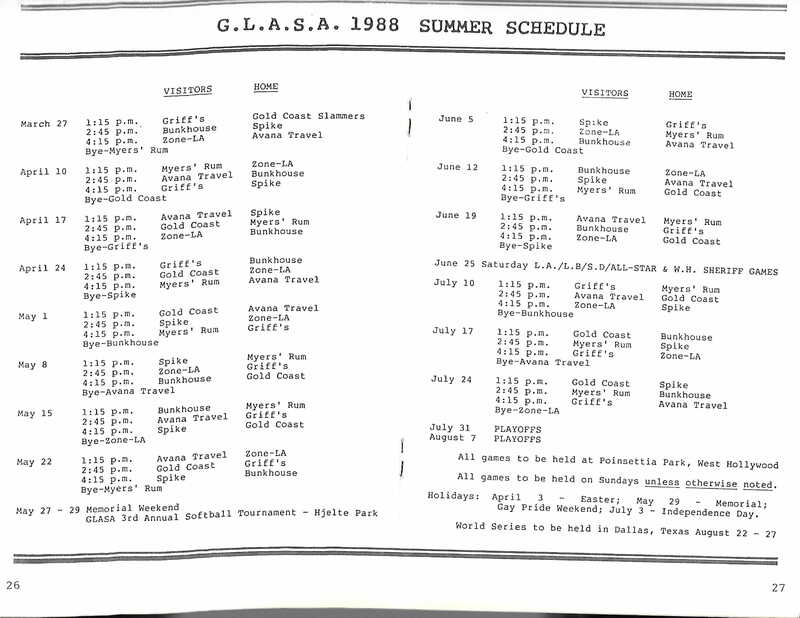 Over the years, three separate GLASA teams (Rafters-Blaze, Destroyers and Killer Bs) have won national titles in that division. 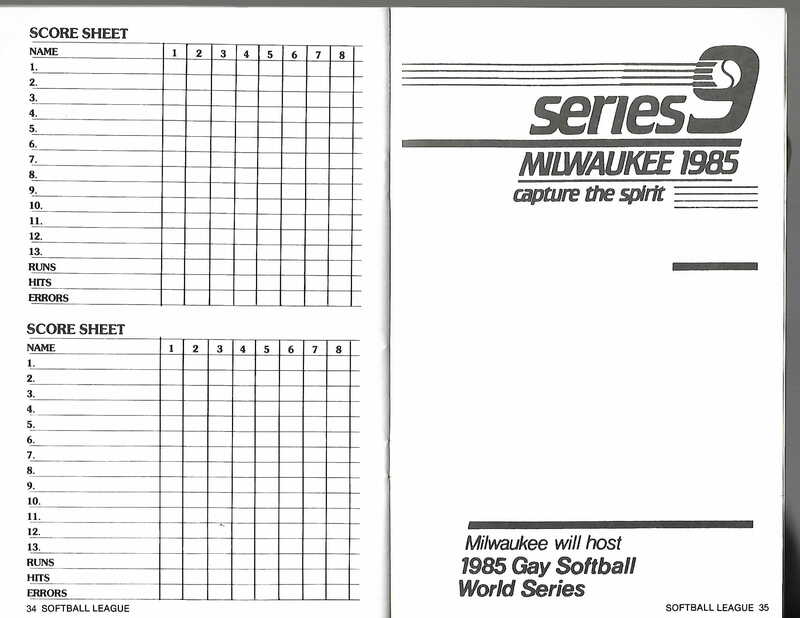 The "C" division was established in 1993. 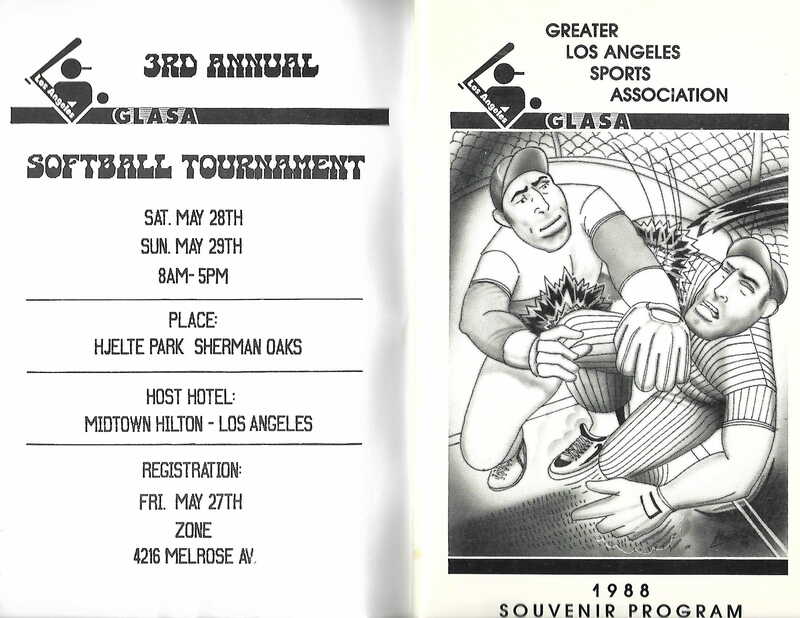 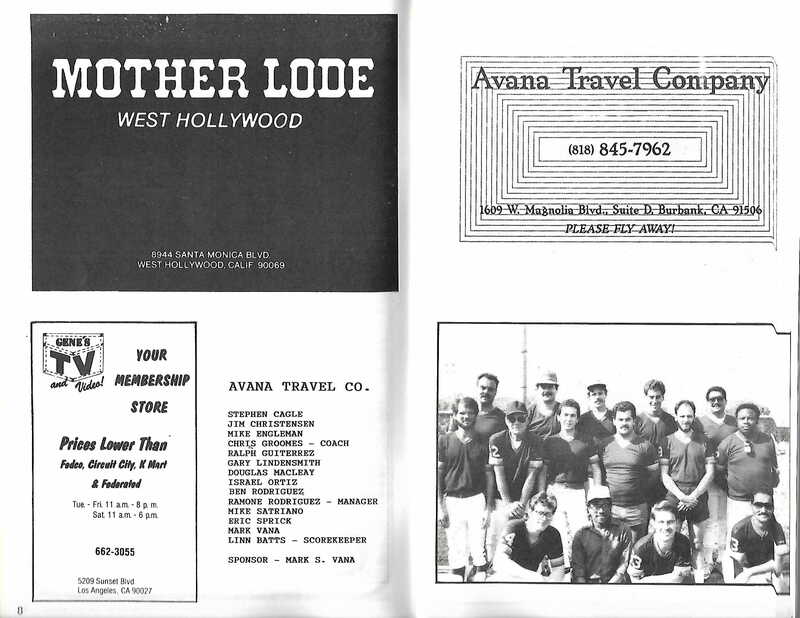 When NAGAAA established the "D" division in 2002 , Los Angeles soon followed its tradition of excellence, with the El Dorado Knights winning the championship in 2003. 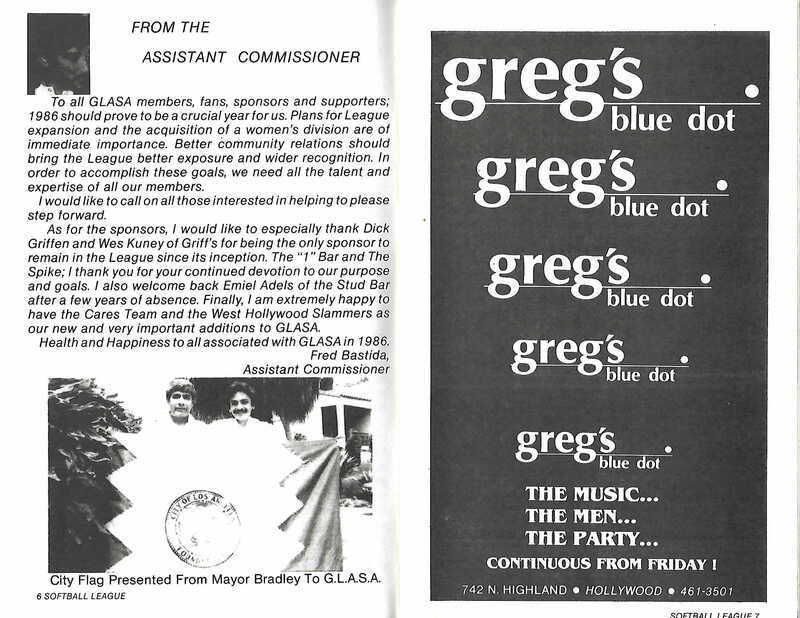 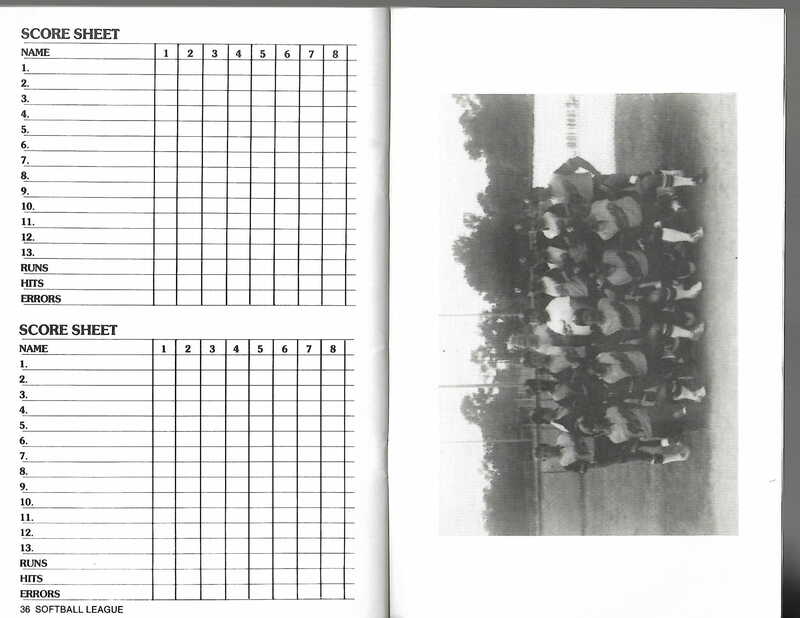 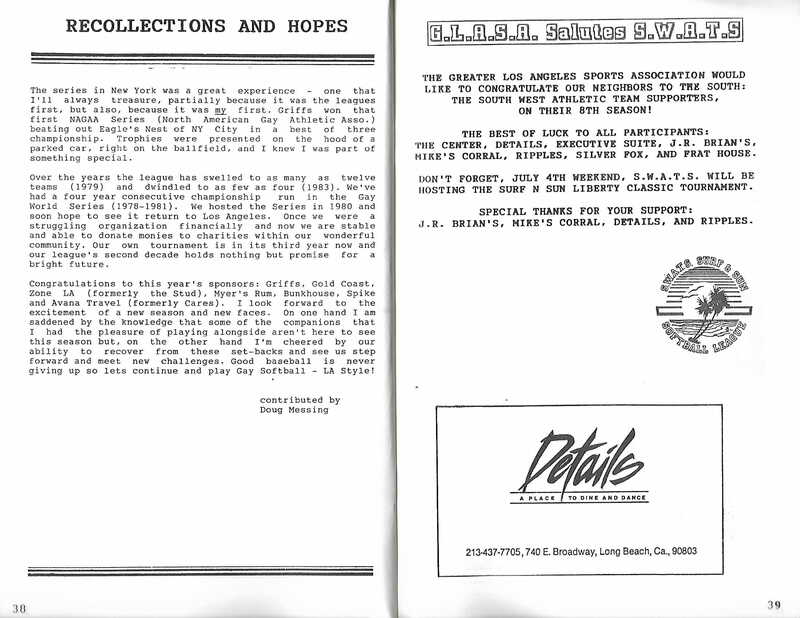 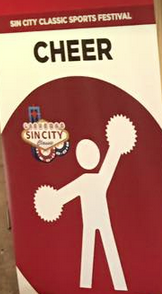 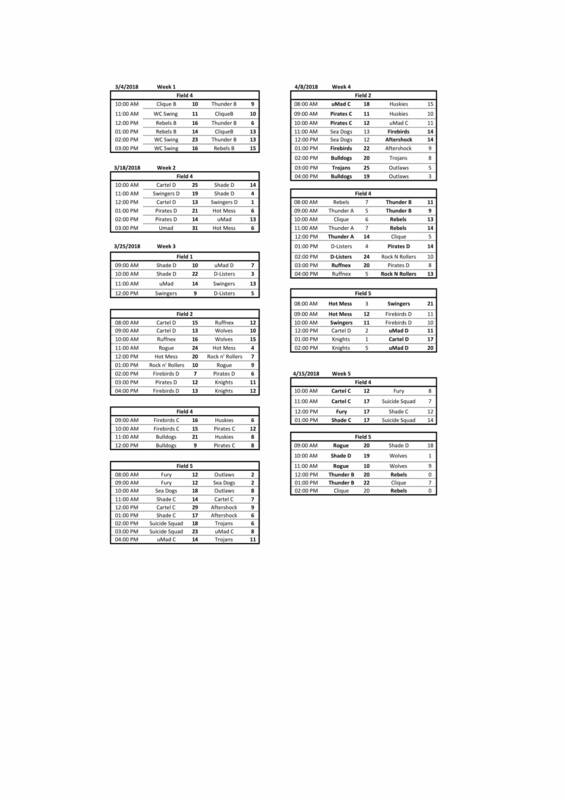 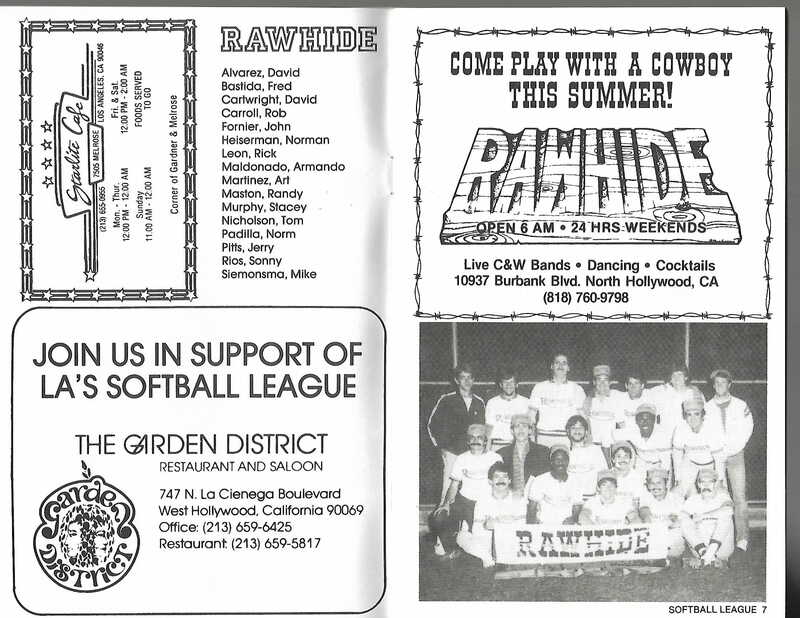 In 1990, we added a women's division, which has since grown to over 15 teams. 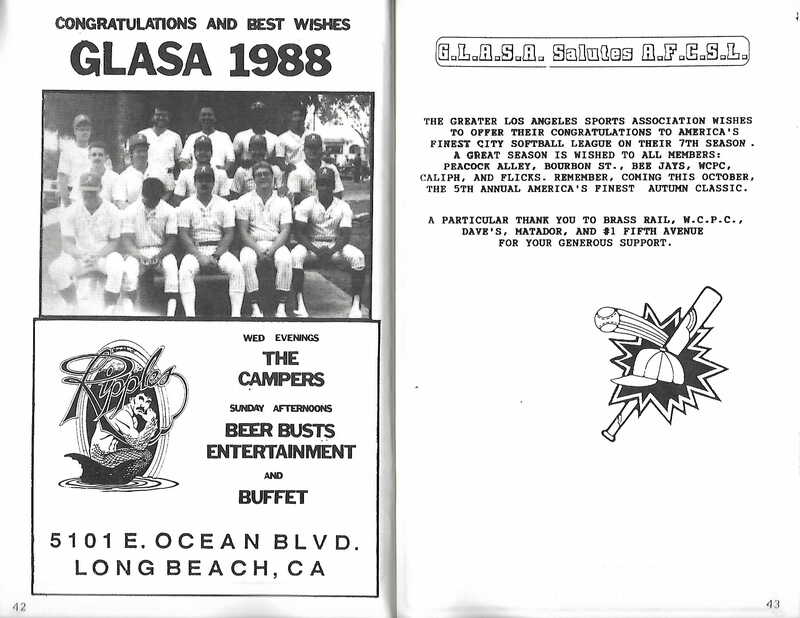 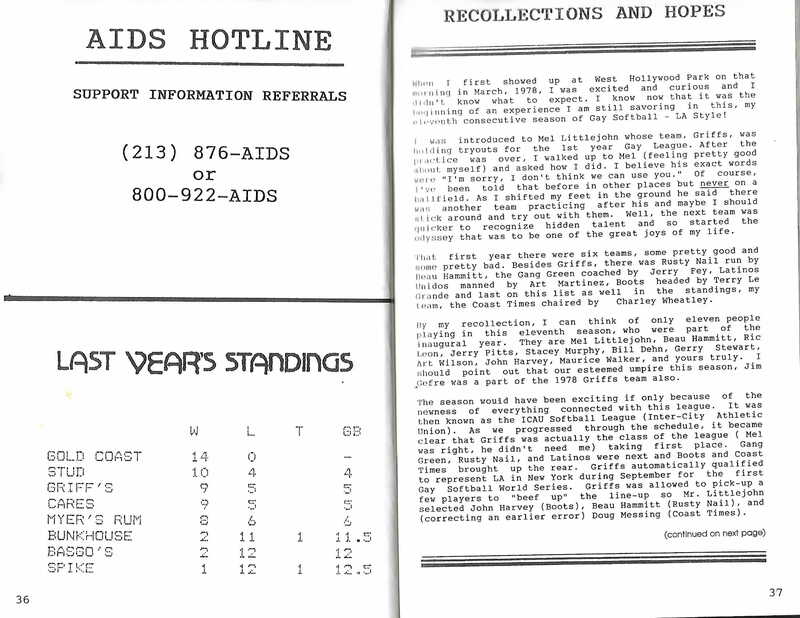 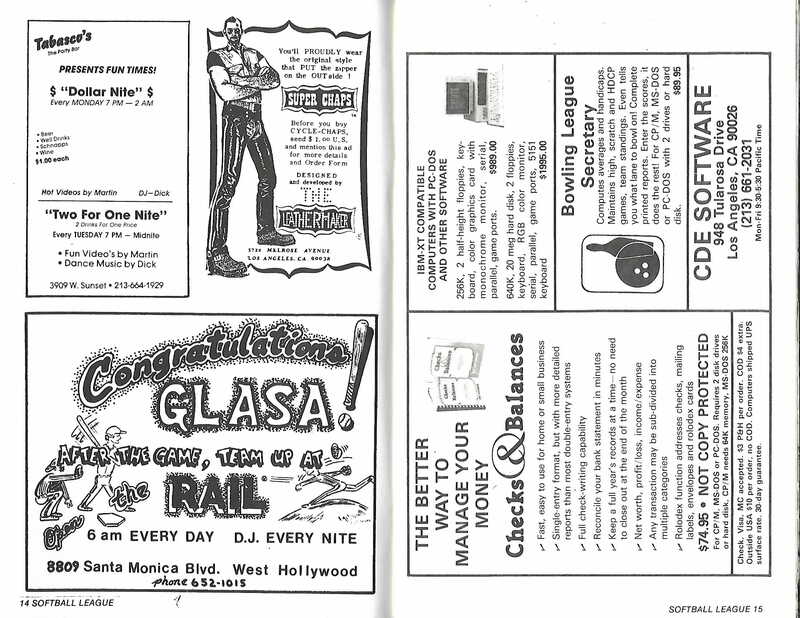 GLASA is proud to have been an early supporter, both financially and through volunteerism, of the efforts of "The Wall-Las Memorias" to establish an AIDS memorial in Lincoln Heights. 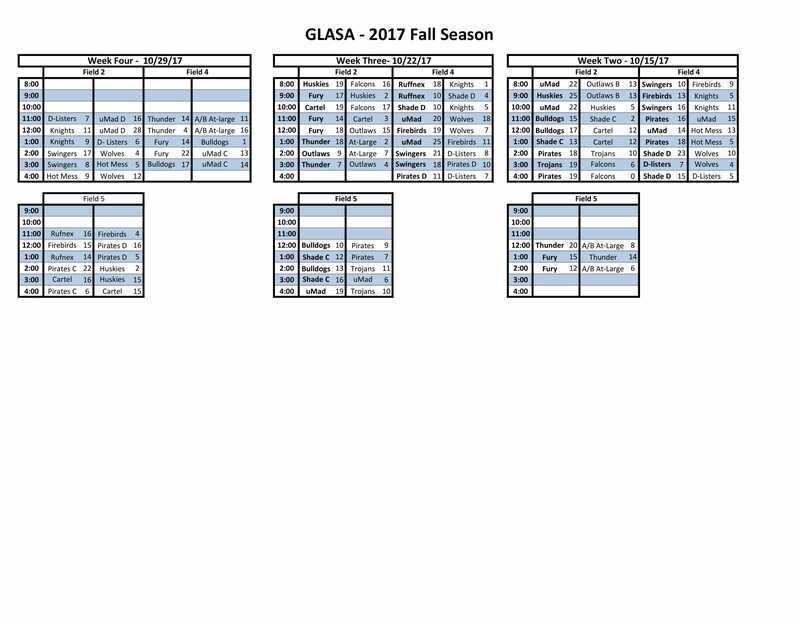 The names of many of GLASA's founding members and early participants are now listed on the memorial wall. 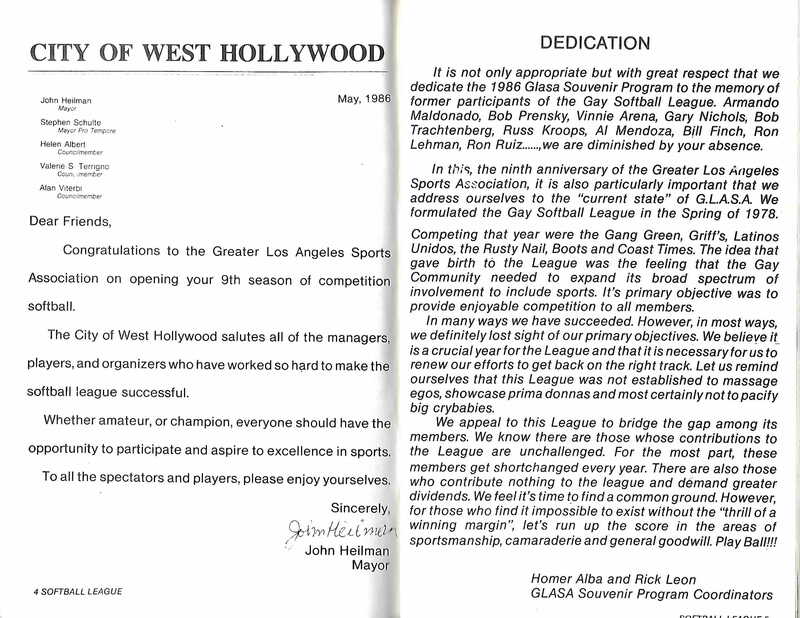 As the league continues to look ahead, we honor our past by creating a Hall of Fame to recognize all the players, coaches, managers and sponsors who have meant so much in the formation and growth of the league. 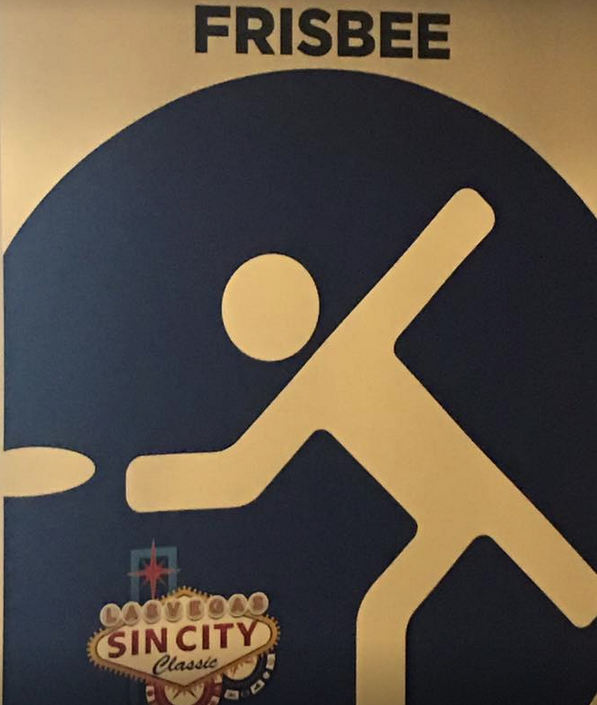 We invite you to be a part of the future.